WHAT IS THE BEST STAIN? This is a question a lot of people ask, and if you have searched the internet for an answer you may have found yourself cross-eyed at some point and sore from banging your head on a wall. The reason is that answer really lies in the perspective of the person asking. The order of importance for stain criteria typically differs between the homeowner to the wood restoration professional. This can also be complicated by the fact that there may be a technically correct answer, and an answer that may be more appropriate for your circumstances (especially where time and money are concerned). This article helps shed some light into answering this question by detailing the top five most common criteria used by both homeowners and wood restoration professionals. The homeowner typically wants a stain that looks great and lasts a long time. This includes concerns of how the stain will perform over several years. The wood restoration professional not only wants a stain that looks great, but is easy to apply, reapply and maintain, and provides long lasting protection to the wood so that the wood doesn't have to be replaced. Sometimes these are longer term goals that a homeowner sometimes oversees when initially purchasing and applying a stain. Too often a homeowner buys a stain that looks great and then later discovers the ordeal they need to go through to remove it before applying a maintenance coat, or discovers problems with peeling and cracking along the way. Many of the stains on the market today, especially some of acrylic formulas can be labor intensive using a combination of heavy duty chemicals and sanding to remove. A wood’s natural oil is its defense system. Wood deteriorates when it loses its natural oil. This is evident in some parts of the country where beetles eat away at trees once they are stressed in drought conditions. This is important to understand because many people want something to "protect" their wood and they are typically only thinking about protection from the sun and weather. At Armstrong-Clark, we believe we need to protect wood from the inside out just as mother nature does. Ask yourself this – when you get dry skin do you want to apply a drying coat (something with water in it), or do you want to apply a conditioning oil? Obviously we want to apply a conditioning oil to replace our body’s oil that has disappeared. Wood works the same way. 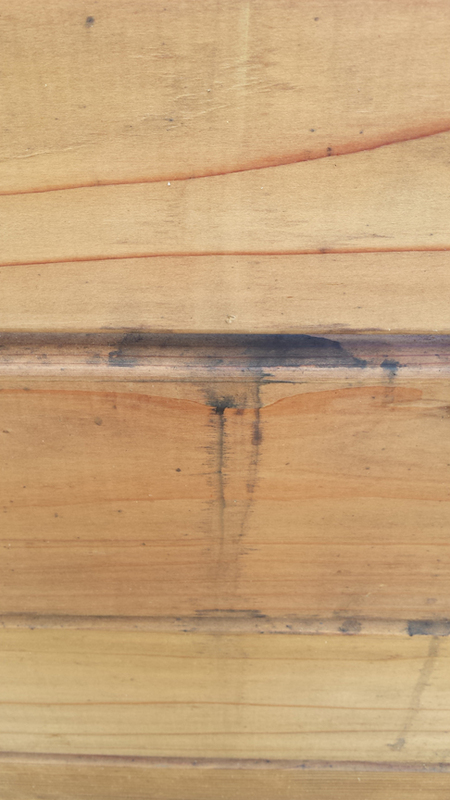 So now ask yourself why you would ever want to apply a stain to wood that doesn’t have penetrating conditioning oil. In summary, we believe a great stain should be long lasting, easy to apply, and a breeze to maintain. The best stain will also protect and condition your wood while looking great without the worries of peeling and cracking. One final note - in recent years there has been a heightened concern about environmentally conscious products both at the government and consumer level. Overall the concerns have not been elevated enough to warrant being included in a list of top concerns, but it is important to know that new regulations are driving the stain industry toward water-borne formulas because most oil based manufacturers have not been able to meet the new VOC requirements with quality products. We expect the rules regulating VOC's will become tighter over time making it more difficult for oil based products to stay in the market place. This complicates what stain to use because many products available today may not be available tomorrow. See "Things To Know > VOC's, Solids, and Government Regulation" to learn more about new government regulations and the Armstrong-Clark Advantage. Can be in direct sunlight and the heat of the day no matter how hot it is without the risk of drying too quickly or leaving sticky puddles and shiners. One coat coverage. A second coat can be applied "wet-on-wet" or "wet-on-dry" to softwoods for extra protection only if the first coat soaked into the wood within 60 minutes. Do not apply a second coat of Semi-Solids except on siding. Walk on stain during application without worries that footprints will remain. *Ability to withstand rain 60 minutes after absorption (not application) applies to normal rain conditions; if heavy down pours are expected it is recommended that you let the storm pass and then let the wood dry for two days (or until moisture content is down to 20% or less). Additionally note that exotic hardwoods take much longer to absorb stain than softwoods. These woods can sometimes take 8 – 24 hours to fully absorb an applied stain. *Pigment is the sacrificial raw ingredient that absorbs UV rays. Transparent stains have lower amounts of pigment and therefore a reduced ability to prevent premature graying of wood. Natural Tone has the least amount of pigment and can only delay the onset of the graying process. For these reasons semi-transparent, and not transparent stains, are recommended for higher elevations. ✝Periodically check cans for leaks. Although the stain may last a very long time the storage environment may provide conditions that lead to pin holes and stain leaking out of the can. All colors are intermixable to create custom colors. Comes in 16 natural colors. With our high solids formula (95% Solids), 95% of our product remains with your wood after the curing and drying process. There is no other stain formula on that market that we are aware of that comes even close, whether it is oil based or water based. 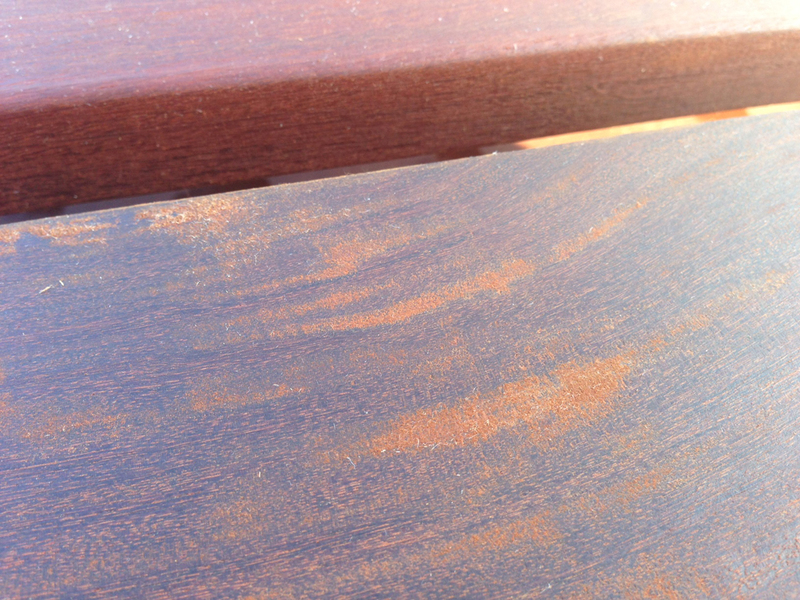 Many oil based wood stains on the market have solids as a percentage of volume that range from 17% - 69%. Not only does that mean that a lot more of what you apply stays behind to protect and condition your wood, but it also means that you get a whole lot more protection for every dollar you spend. For every $10 of stain you purchase, $9.50 worth of Armstrong-Clark stain remains behind after the curing and drying process. With our competitors, only $1.70 - $6.90 worth of product remains. 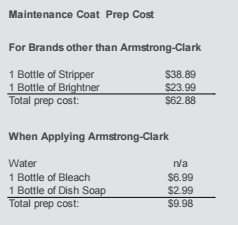 When applying a maintenance coat with most stains other than Armstrong-Clark, you need to purchase both stripper and brightener. These chemicals can add quite a few additional dollars to the cost of a project compared to using just a little water, bleach, and dish soap. Once bottle of stripper can cost $38.89 and a bottle of brightener can cost $23.99 bringing your prep chemical cost to $62.88 assuming one bottle of each is enough to complete your job. Contrast that to $6.99 for a bottle of bleach and $2.99 for a bottle of liquid dish soap for a total of $9.98 if you do not already have the little that you need to clean your wood. VOC's (Volatile Organic Compounds) are components including solvent, thinner, naphtha, and other ingredients that evaporate from stain. In an effort to reduce ground-level ozone both the EPA and several states have passed legislation to reduce VOC's. As of December 2015, the national limit is 550 g/l, seventeen states have a 250 g/l limit, and four counties in Southern California have a 100 g/l limit. 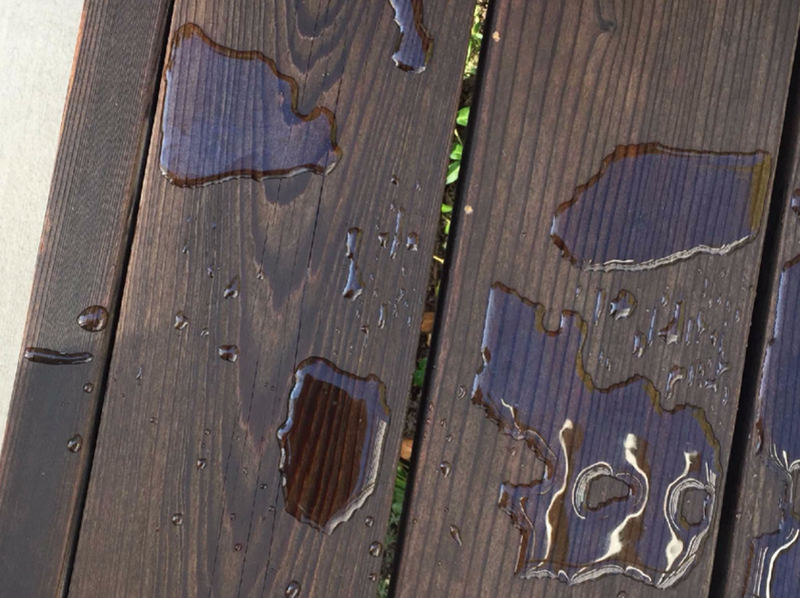 These limits are pushing the wood stain industry toward water-based stain formulas as most companies have been unable to formulate an oil stain without the solvents, thinners, and other ingredients historically required for oil stain. Armstrong Clark oil based wood stains have a VOC limit of <50g/l while most other oil based stains have VOC limits of <250g/l and <550g/l. With our low VOC limit we are confident that our products will remain in the market place for a long time while we may see some other product formulas change to keep within government guidelines. Solids are the part of a stain that remains behind after the drying or curing process. This includes pigment, mildewcide, water repellents, dryers, and oils (or resins). Components to a stain that aren't solids are the things that evaporate away. These include water and solvents. Armstrong Clark oil based wood stains are 95% solids. Most major brand stains have solids in the range of 25% to 60% by volume. That means with Armstrong-Clark stains more stain stays behind protecting and conditioning your wood than our competitors. Even when our stain may cost more, you are getting more product for your dollar. Ask yourself this, if your hands get dry and chapped do you want to apply a water-based drying coat, or a condition oil/ lotion. Obviously you want an oil based lotion to replace the natural oils that are not present. Wood is very much the same way. Water cannot condition wood, but oil can. When it comes to oil not just any oil will work, you need non-drying conditioning oils. Similiarly you wouldn’t just use any oil to heal dry skin. We believe this is biggest concept in understanding the difference between water and oil-based wood stains. Generally speaking, water-based stains are environmentally friendly film forming stains that can clean up with soap and water. They dry quickly which can be a challenge. Especially in hot weather and in direct sunlight the water evaporates quickly which thickens up the stain and risks sticky/ gooey puddles, too thick of a coat being applied, or footprints being left behind. They do risk peeling and cracking due to the thermodynamics of wood expanding and contracting with changes in temperature, and from trapping in moisture that may be trying to escape the wood. Often water-based stain colors (including some oil formulas) can be pastel from the tint base being used and therefore aren't as natural looking. These stains need to be stripped before a maintenance coat can be applied in the future. Generally speaking, oil based wood stains are long lasting and allow the wood's grain and texture to be seen. They protect against Mother Nature as oil is a natural defender against water and elements. These stains have solvents in them and require clean-up with mineral spirits and careful disposal of used rags to prevent spontaneous combustion. Oil based wood stains penetrate down into the wood and condition the wood to help prevent cracking, curling, warping, and cupping. Drying times can vary depending on how much solvent is in the formula. Most low solvent formulas risk the solvent flashing out of the stain quickly from the heat in hot temperatures resulting in premature drying resulting in thick and sticky puddles and shiners. The higher the solvent the more adverse an odor they give off. There are film forming and non-film forming oil based stains. Non-film forming oil stains have soft coats which make it easier for mold and mildew spores and food (like pollen) to stick to and grow. In recent years government regulations have brought VOC limits down driving the industry toward water-based formulas. See "Things To Know > VOC's, Solids, and Government Regulation" to learn more about VOC's and government regulations. Even though Armstrong-Clark oil based wood stains are a low VOC oil stain, they can be applied in direct sunlight no matter how hot it is without the risk of drying too quickly or leaving sticky puddles and shiners. A hard coat stain is a stain that dries as a hard and firm film as commonly found with water-based latex and acrylic stains, as well as some oil stains. The advantage is that the stain does protect against wear and abrasion. The downside is that they can peel or crack, they typically do not condition wood, they require chemical stripping (or heavy sanding) before maintenance coats can be applied, and in some cases they create a barrier that doesn’t allow wood to breathe. A soft coat stain is a stain that does not have a hard film like some oil based stains. The advantages include allowing the wood to breathe, no peeling or cracking, and in some cases stripping is not required on maintenance coats. Typically, the downside is that they do wear away over time from a combination of abrasion and Mother Nature. On horizontal surfaces, water can sit and eventually penetrate down into the wood floating the oil out of the wood. Lastly, the more pigment in a soft coat the more rub-off will be experienced. This usually is not a problem with tracking stain into a house (unless over applied), but it does create potential problems with application to furniture and sitting surfaces for some stains. With Armstrong-Clark wood stain you get two layers of protection with one brush stroke. Unlike other soft coat formula's, Armstrong-Clark oil based wood stains have drying oils that separate creating a barrier that protects and locks in the non-drying side of the formula by locking mother nature out. UV rays oxidize and degrade wood turning it gray. Pigment is the sacrificial raw ingredient in stain that absorbs UV radiation and fades over time while protecting the wood. The more pigment a stain has, the more UV protection the wood has. 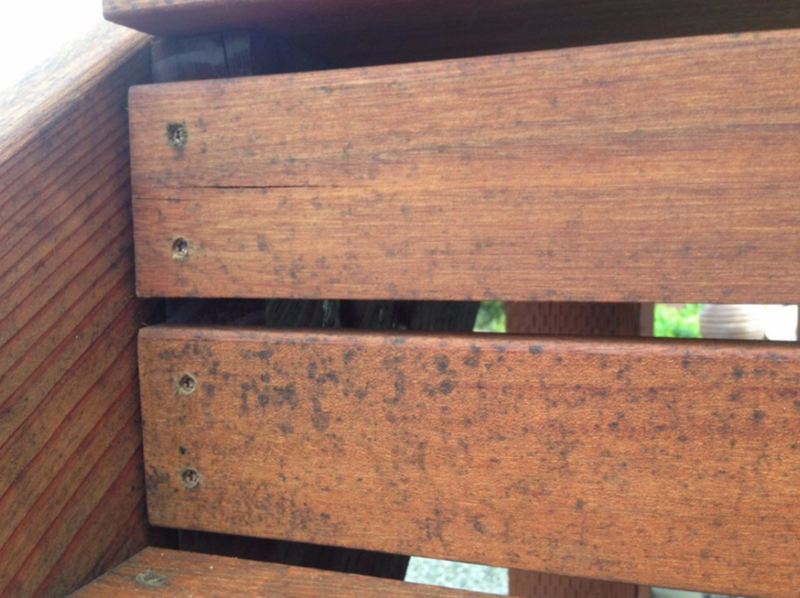 However, the more pigment a stain has, the more the texture of the wood is covered up. Wood at higher elevations will experience stronger UV rays. Therefore, more pigment is required to obtain the same protection as lower elevations. Transparent stains at higher elevations fade quickly and we typically recommend Semi-Transparent stains if UV protection is desired. 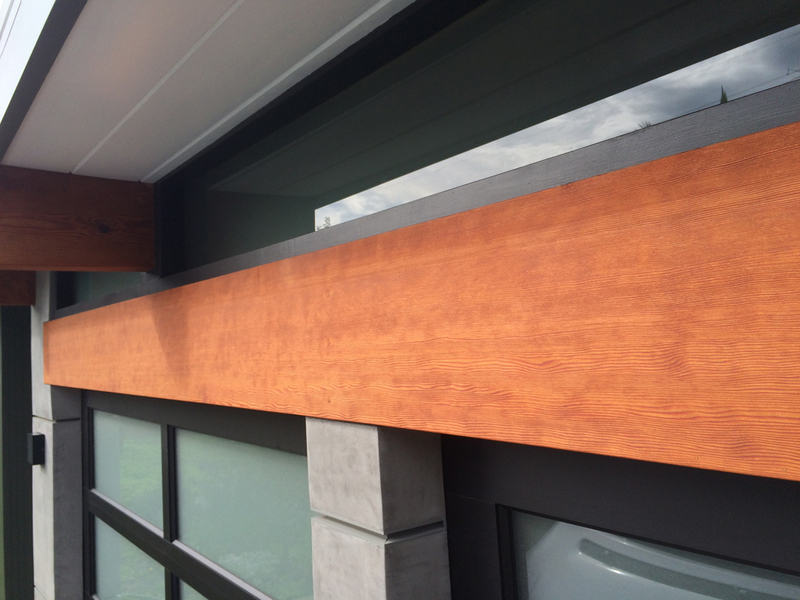 Armstrong-Clark transparent wood stains (Cedar Tone and Redwood Tone) have 4x more pigment than our Natural Tone providing much longer protection from the sun. Our Semi-Transparent stains have 2X's as much pigment as our Transparent stains providing protection for 20%-30% longer than our transparent stains. Lastly, our Semi-Solids have 4x as much pigment as our Semi-Transparent stains providing the most amount of UV protection, but limiting your ability to see much of the wood grain. Lastly it is important to know that more pigment does not necessarily mean that the stain itself will last any longer. For example, a semi-solid’s UV protection will be greater and last longer than a Semi-Transparent stain. However, the stains themselves will still last the same amount of time and need to be re-stained in about the same amount of time. Many stains in the market place use a tint base in their stains, very much like paint. This allows the manufacturer to provide a large variety of colors to the customer while keeping the cost down by reducing the amount of pigment required in the formula. The unfortunate downside to this is that resulting colors often have a pastel like appearance because of the white base in the formula. The most natural looking stains in the market place achieve color not by including a tint base, but by achieving color through higher concentrations of pigment in their formulas. 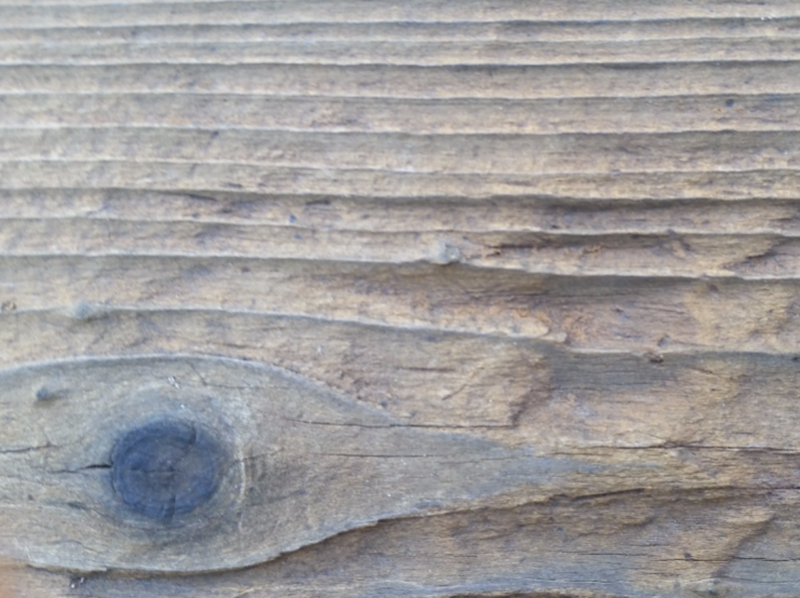 There is misconception that stains and sealers must provide absolute water beading to protect wood. A sealer that provides absolute water beading may not allow the wood to breath and shed itself of any moisture it absorbs from untreated surfaces. 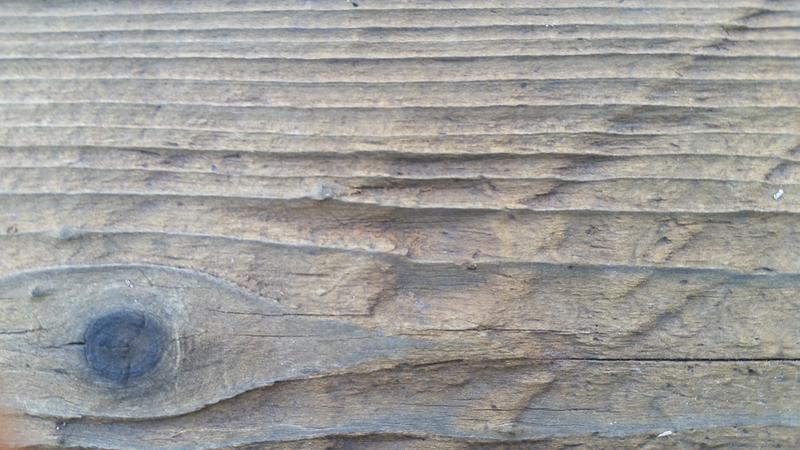 This may ultimately lead to peeling and cracking of a sealer, or worse, to decay of the wood. 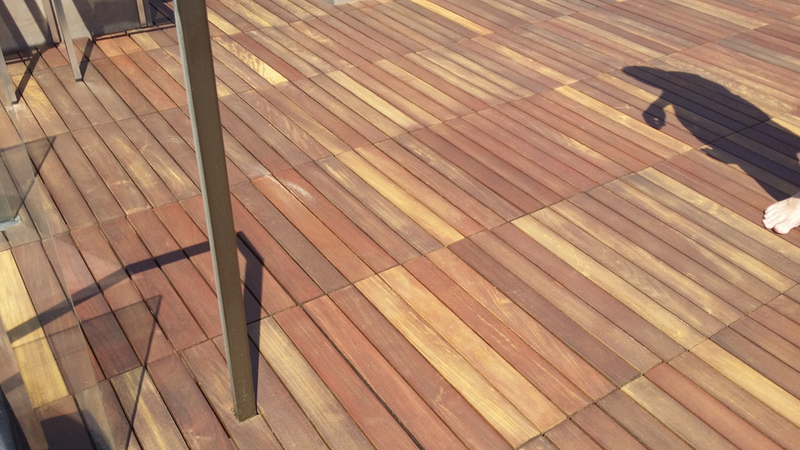 Ideally, a sealer will repel water when it precipitates while still allowing the wood to breathe in all weather. 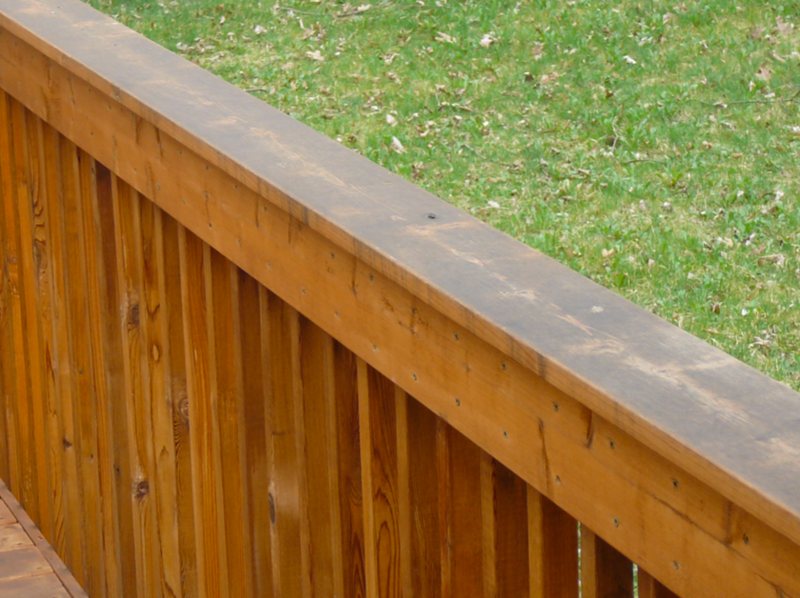 Armstrong-Clark oil based stains provide absolute water beading initially while always allowing your wood to breathe. Even after the absolute beading has dissipated, your wood is still protected as the oils that penetrated the wood upon application repel and wick water away. 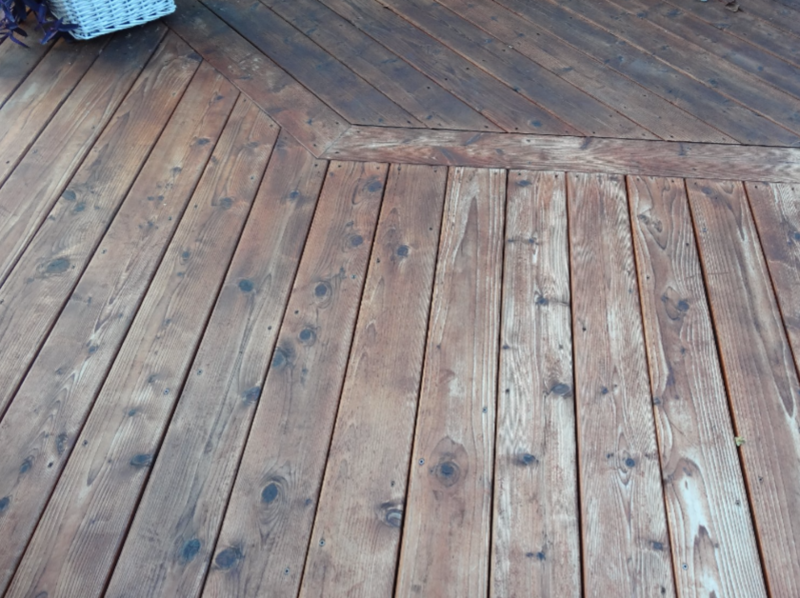 If you have a deck that has limited or inadequate ventilation, there is an very good chance that you will be fighting moisture issues that cause premature failure of both your wood and any stain that you apply. When decks are built close to the ground, or the sides are sealed off (closed up), moisture coming up from the ground will work itself up into, and through the deck boards. This will cause premature failure of your stain. If the deck is close to the ground there is nothing that we know of that can be done. The following pictures collected from various websites on the internet depict potential design problems. Instead of building a wall that seals off a "crawl space" consider installing lattice to let the space breathe as the photo found on the internet below depicts. ALWAYS test stain for color and absorbency before proceeding with staining. Sample cans are available to test for color. Please call us if you have less than 18” ground clearance on a deck, or if your deck does not have adequate air ventilation underneath.Visit our website for details on testing and to read the product data sheet. The product data sheet and website may provide more specific information for your application situation than can fit on the can or this instructional brochure. Always test for color before proceeding with a job with a sample can. All colors are intermixable to create your custom colors. Wood moisture content must be 20% or less as determined by a moisture meter; 15% for cedar shingles and redwood to help prevent tannin bleed. If you do not have a moisture meter, touch ends of wood and feel if damp. If damp, wait. Do not apply with a rag. Brush out any puddles before clean-up. Do not wipe applied stain after application. The soaking in period is 24 hours. Only wipe if there are wet spots after 24 hours. If puddles are more like "thick wetter" spots due to over application consider waiting another 24 hours before wiping. Place rags in a metal container with water after wiping for at least one week to prevent spontaneous combustion. An empty stain can can be used for the metal container. See specific application instructions below. 1 coat only. NO SEMI-SOLID colors. For transparent colors apply stain and let dry. For Mahogany, Amber, and Semi-Transparent colors wipe off stain after 1 hour to prevent pigment rubbing off onto clothes once dry. For these colors the process is more for tinting wood than achieving a rich looking stain. Easy application by brush, stain pad, roller, or airless spray equipment. No garden sprayers. Back brushing or rolling recommended with spray applications. Semi-Solids Colors: One coat only for all applications except on fire retardant shingles. Recommend using a brush or stain pad for application to prevent over application which will result in rub-off. Rollers and spraying carry higher risks of over application. All Other Colors: A second coat can be applied for extra protection ONLY IF the first coat absorbs into the wood within 60 minutes. Wet-on- wet is recommended, however it can be applied wet-on-dry. Footprints during application will disappear during the curing and drying process. Have lower expectations for color and longevity when applied to wood less than one year old, especially if the wood is six months or less old since installation. Apply 2nd coat of Semi-Solid stain "wet-on-dry" with at least 48 hours apart between coats. Only apply Mahogany and Amber colors. Hardwoods have a limited ability to absorb wood stain. Sparingly apply single thin coat with brush, stain pad, or dual roller kitchen sponge mop. Natural Tone can be applied but it will not prevent wood from graying. Generally speaking we recommend waiting for exotic hardwoods to be six months old due to their dense cell structure. Applications to newer exotic woods including Ipe, Mahogany, Teak and others may only last a few months. 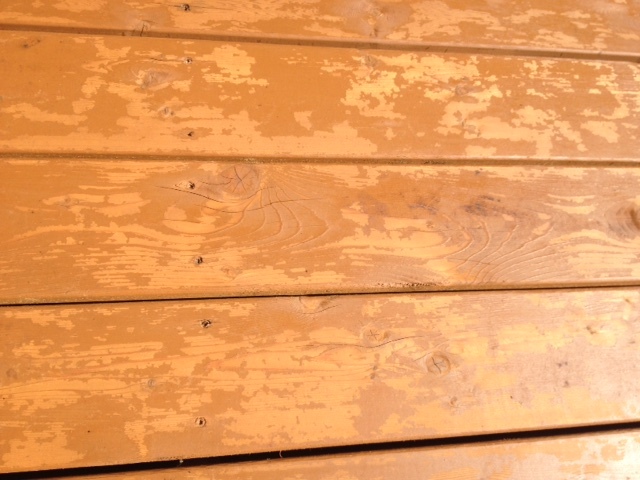 Review existing wood for rot and decay three to six months prior to stain application. This allows replacement wood to age and weather some to better accept stain during application. Cleaning solutions or stripping chemcals can get pushed onto plants and painted surfaces during the rinsing process, especially when power washing. Consider covering plants and bushes, and masking off painted surfaces first. On hot days, consider cleaning/ stripping in the morning when it is cooler so that covered plants and bushes to not over heat and die. If not covering plants, rinse them down with water to prevent chemicals that land on them from sticking. Typically using a 40 degree tip 12”+ from the surface of the wood should work fine. Always check to make sure the wood is not getting damaged when power washing. Excessive brushing or power washing can fur wood. Do not scrub excessively hard. When power washing use the lightest pressure and nozzle combination. 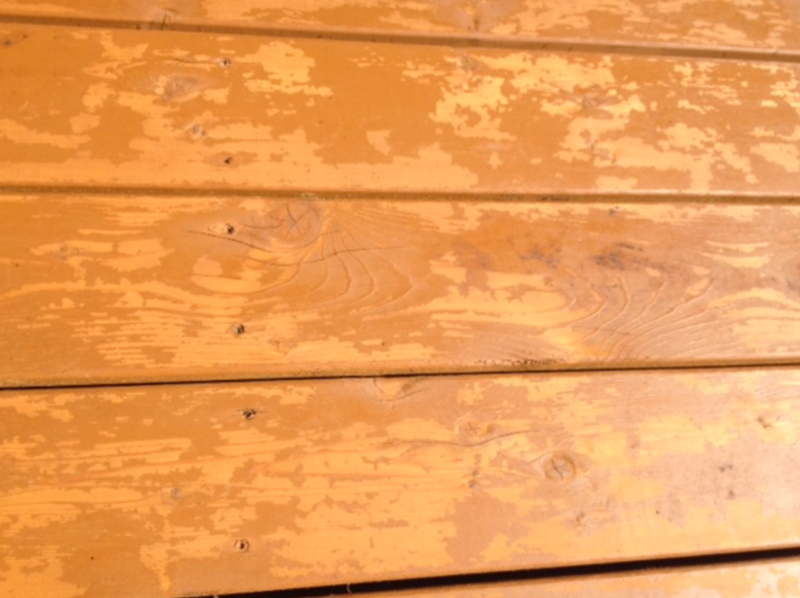 Excessive power washing will "raise the grain" as the softer parts of the wood are removed in the process. Excessively strong cleaning chemicals or strippers, or leaving these chemicals on wood too long can fuzz wood. Only use chemicals strong enough to complete the job and do not let them dwell longer than needed. Necessary dwell time can be determined by test scrubbing every 3 to 5 minutes with a scrub brush. Strippers and most cleaning solutions require the use of brighteners to counter their caustic pH. Brighteners "blonde" wood, bleach based cleaners whiten wood. If a brightener is not required, consider the final desired color before using a brightener. For example - a red stain on blonde wood may shift the color orange, while red on a whiter wood will stay more true to the red stain. NEVER mix liquid bleach and oxalic acid (brighteners). A HARMFUL/ TOXIC chemical reaction occurs. NEVER mix liquid bleach and oxygenated bleach (sodium percarbonate). A reaction accelerates rending your chemicals useless. If sanding, do not use higher than 80 grit unless absolutely necessary. The higher you go past 80 grit the more the absorption of stain is inhibited. Orbital sanders may leave swirl marks with 80 grit. You can go to 100 to prevent marks but absorption may be hindered some. When testing for color before proceeding with application, test in an inconspicuous spot. For example where a door mat or flower pot will be placed, or behind a bush. DO NOT prepare wood and apply stain when pollen is blanketing surfaces. Pollen is mildew and mold food. For morning applications, wait for morning dew to dry. If you live in a humid and/or shaded environment conducive to mold, mildew, and algae growth, consider purchasing additional mildewcide to add to the stain, or consider spraying a mildewcide solution like "Wet & Forget" and "Spray & Forget" on the wood once a year as a preventative measure. Stain pads and brushes provide the greatest control for stain application. Rollers and spraying have higher risks over application of stain resulting in rub-off problems. Stain horizontal surfaces before vertical surfaces. This way any drips that land on the wet horizontal surface can be brushed out. Consider applying two coats of a semi-transparent or hardwood stain instead of one coat of a semi-solid stain when the first coat absorbs into the wood within 60 minutes. This provides additional protection to the interior of the wood while adding extra protection to the surface. Use a sample can to confirm if your wood can absorb two coats. For higher elevations consider semi-transparent colors over transparent colors. Their higher pigment concentration better protects against the strong UV rays at these elevations. AVOID SPONTANEOUS COMBUSTION! Place all rags and sponges in a water filled metal container after use to prevent spontaneous combustion. If you do not have a container use an empty stain can. Let the rags sit for at least one week. Saturate any large textiles like drop cloths or paper products used for drop sheets or spray guards with water. Wash clothes with stain on them - do not leave them lying around. Clean tools with mineral spirits or paint thinner. Blow off, sweep off, or hose off wood surfaces once a month to remove dirt, pollen, and other food sources for mildew and mold. Do not scrub. If you live in a humid or damp environment consider applying a scrub free mildew stain remover (Wet & Forget) to control surface mildew. Inspect your wood for any wood rot or decay and replace any boards as needed. Ideally you will want to replace rotted boards three to six months before you plan on staining so that they can weather. Do not start the cleaning process and apply stain during the pollen season. Pollen can land on cleaned surfaces after cleaning while drying and can mix in with stain while applying. Pollen is a source for mold and mildew and most stains do not have enough mildewcide to combat this much food. 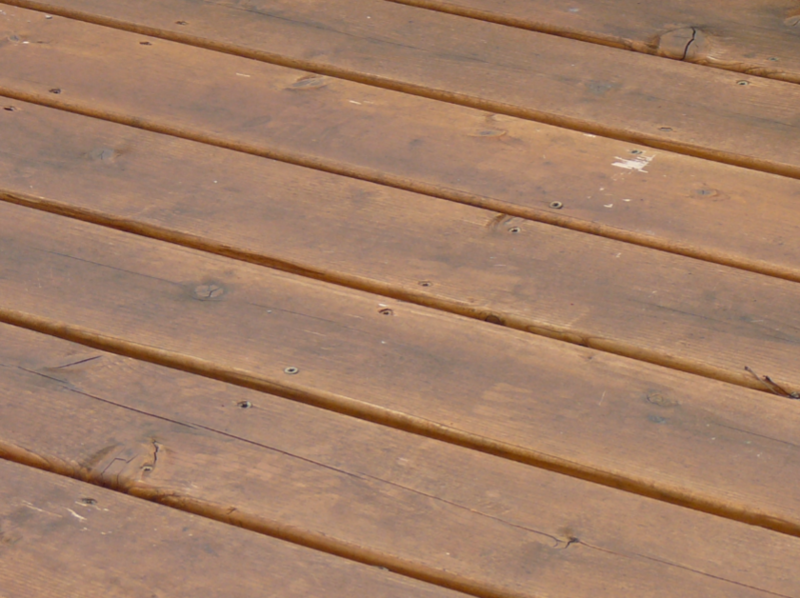 If painting a house and staining a deck, we recommend staining your deck first. Cleaners/ strippers can ruin painted surfaces. Otherwise, mask off all areas of your house that may come in contact with chemicals during the application and rinsing process. Cover any plants and painted surfaces before preparation. Consider working earlier in the morning so that covered plants do not overheat and die. New Wood: Moisture Content to be 20% or less, or below 15% for cedar shingles and redwood. Test for stain absorbency with the water sprinkle test. If water absorbs within two minutes you are ready to proceed. If not, wait one month and retest. See "In-Depth Topcs > Pre-Stain Testing > Testing for Absorbency > The Sprinkler Test" to learn more about the water sprinkle test. Mask off painted surfaces to protect them during the application or rinsing of cleaning or stripping chemicals. During rinsing chemicals can get blasted onto surfaces from water pressure. Consider covering bushes and plants. When covering plants and bushes be sure not to do so in the hottest part of the day so that they aren’t overheated and die. Typically we recommend working in the early hours of the day. If covers are not available at least wet down before application and understand this may not be sufficient protection. Unstained wood and wood previously stained with Armstrong-Clark: clean with 1 part bleach to 3 parts water with a squirt of liquid dish detergent. Lightly scrub and rinse thoroughly with hose or light pressure wash. Rinse all solution off before 20 minutes has passed. 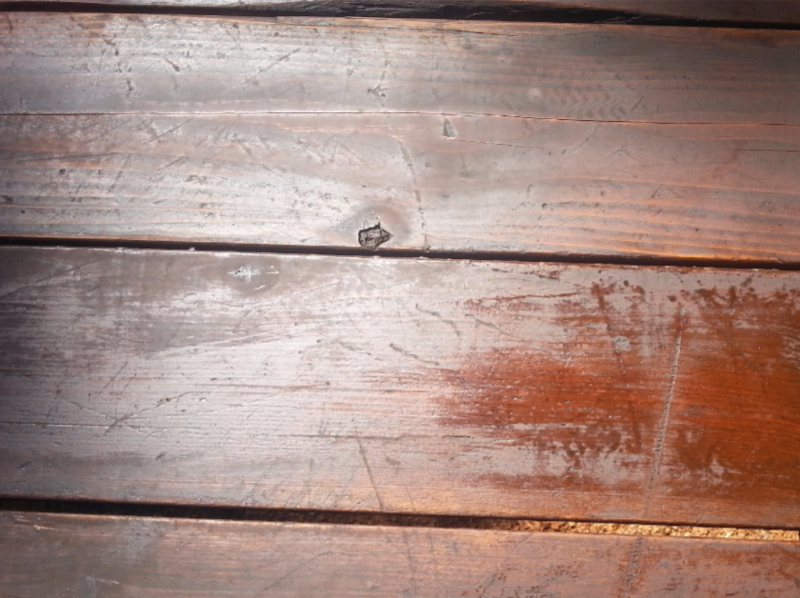 Wood previously stained with another brand of stain: strip off previous stain and then have a brightener applied to neutralize the pH of the stripper. Note – there are a limited number of strippers on the market that do not require brightener. OPTIONAL: Lightly sand wood surfaces with 60-80 grit sand paper to remove loose wood fibers other matter that reduce the longevity of applied stain. Wood restoration professionals do not skip this step. Before applying stain, confirm cleaned wood has dried to a moisture content of 20% or less as determined by a moisture meter, 15% or less for cedar shingles and redwood. If you do not have a moisture meter when requiring 20% or less moisture - wait 48 hours after cleaning and touch the ends of the wood. If the wood feels damp wait until it feels dry. Test for color with a sample can to ensure color is accurate. All Armstrong-Clark colors are intermixable should you want a custom color. We recommend blending whole can ratios. Color Testing Tip: Apply color sample the same manner you will apply stain on job. Application method can affect thickness of stain applied and therefore the color. Also watch to see how long the stain takes to absorb into the wood. This will provide insight into whether or not you need to pay extra special attention during application to not apply too heavy a coat of stain, especially on newer wood. This also provides insight into whether or not you will be able to apply a second coat. 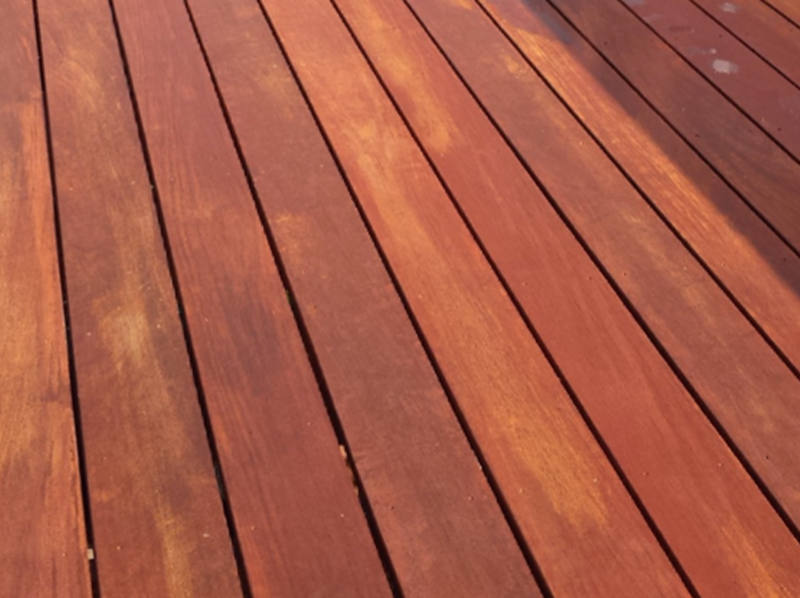 Stain can be applied in direct sunlight and the heat of the day no matter how hot it is. 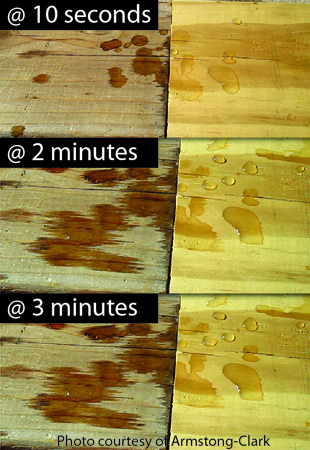 Applied stain can be exposed to rain 60 minutes after it absorbs into the wood (not 60 minutes after application). If heavy rain is predicted we recommend waiting until after the storm has passed and wood has dried. Only apply when temperatures are above 50 degrees F. If temperatures dip below 50 in the evenings, keep your stain inside at night and apply in the warmest part of the day. Freezing after absorption will not affect our stain, but it will lengthen the drying time. Apply with a brush, roller, or airless sprayer. No garden sprayers. Back-brush or back-roll all spray applications. Do not apply with a rag. Brush out any puddles before application is completed. For exotic hardwoods we recommend a stain pad or dual-roller kitchen sponge mop and not using a roller. For semi-solids we do not recommend using a roller to prevent applying too much stain that can result in rub-off. For sponge mop application on woods like Ipe – dip mop in stain pan, do not squeeze out the stain, blot out on wood, and then mop out the stain using the mop like a squeegee. A brush is typically needed to cut in where horizontal and vertical surfaces meet. 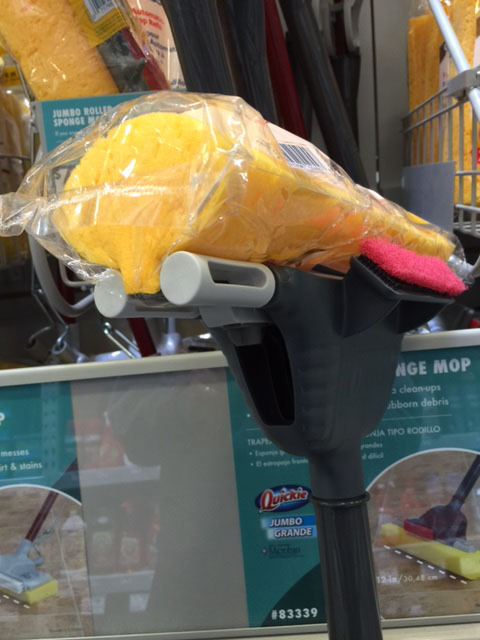 For sponge mop applications use mops should have a sponge similar to the sponge shown here. Do not use a sponge with a scrubbing pad. For softwood applications of transparent, semi-transparent, hardwood colors only - if the first coat soaks in within 60 minutes, a second coat can be applied for added protection if desired wet-on-wet. Footprints on the first coat will disappear during the soaking in period. DO NOT apply a 2nd coat of stain on exotic hardwoods, and to not apply two coats semi-solid colors on any application other than fire retardant shingles. DO NOT WIPE stain off during application. Our soaking in period is 24 hours. Only wipe any puddles after 24 hours. Brushing out puddles before finishing application helps prevent this problem although it may not eliminate the issue if stain was over applied. Prematurely wiping can remove mildewcide, pigment, and the drying oil that protects the non-drying oil. Wait 8 hours for light traffic and 72 hours for complete drying and curing. Cooler and/or damp weather will lengthen drying and curing times. When completed, place any used rags in a water filled metal container with a lid for at least one week. An empty stain can can be used for the container. Application Tip: Even though Armstrong-Clark stain contains mildewcide, if you live in an environment prone to excessive mildew, mold, or algae growth consider purchasing additional mildewcide to add into your stain. Over Application: The most common results from over application include stain puddles or shiny wet spots 24 hours after application or significant rub-off onto shoes and clothing once dry. When water is applied to a surface that has had too much stain applied you will see an oil slick (or rainbow) on the surface of the puddle. Several months to a year after application the stain will look noticeably darker (or dirty) and there may appear to be spots where stain appears to have chipped away. To keep you deck looking its best, once a month sweep, blow, or hose off your wood surfaces, especially horizontal surfaces like decks. Doing this will help remove food sources for mildew and algae that include pollen. It will also help reduce problems with tannin staining resulting from leaves and twigs that sit on your surfaces. If your wood is in a heavily shaded area and/or humid environment that is conducive to mold and algae growth you may want to consider a spray application of a mildew/ algae killer/inhibitor/preventer like Wet & Forget to help remove and prevent these growths. These formulas are environmentally friendly and do not include harsh chemicals. Understand that they do not work overnight and work over a long period of time. New wood has a number of contributing factors that limit the color, absorption, and durability of an applied stain. In addition to higher moisture content (in wood that is not kiln dried), new wood has higher concentrations of natural oil. This natural oil inhibits the absorption of an oil stain because there is nowhere for the stain oil to go. The pores of new wood are closed, and there is mill glaze on smooth cut wood that must be removed. The mill glaze can be removed and the pores can be opened up (marginally) by lightly sanding with 60 grit sandpaper, applying oxalic acid/brighteners, cleaning with a liquid bleach solution, or applying a stripper and then a brightener. Note that just because wood is kiln dried it doesn’t mean it is ready for stain upon installation. In preparation, some wood restoration professionals will apply a light stripper and brightener to help "beat up" the wood a little and open the pores for better absorption. New wood typically will only get one coat of stain. A regular 2-year main schedule can start in 12-18 months after the initial application. Have low expectations for color and durability on newer wood and NEVER apply an Armstrong-Clark Semi-Solid stain to wood less than 1 year old. Too much pigment will sit at the surface resulting in rub-off. The most common question is how soon can I stain my wood? The answer is let the wood tell you. First, a moisture meter is used to confirm moisture is down to 20% or less for many applications, 15% or less for cedar shingles. It is advisable to consider 15% or less with species like redwood and western red cedar to reduce induction and help prevent tannin bleed. Conducting a sprinkle test tells us when wood will accept stain. Wood will absorb stain similar to how it absorbs water. Sprinkle some water droplets on the wood. The wood is ready to accept stain when the droplets start spreading out and soaking into the wood within 2 or 3 minutes. This test does not work well on exotic hardwoods as their tight grain naturally inhibits water absorption. Only apply one coat of stain on initial applications, NO semi-solids. New wood often requires a maintenance coat 12-18 months after an initial stain application. Generally speaking, exotic hardwoods and pressure treated wood need six months. Cedar generally needs two to three months before staining. 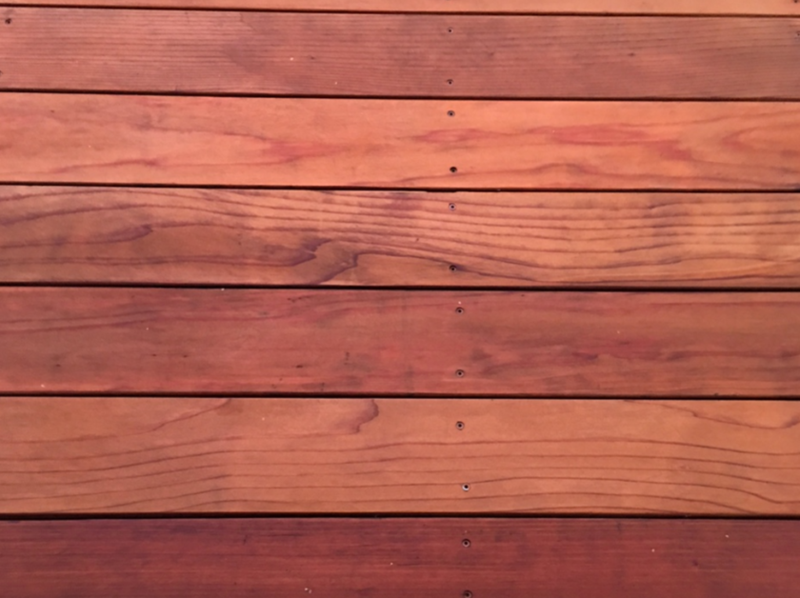 Owners of redwood typically want to stain right away to preserve the two tone colors of the wood. Unfortunately both redwood and western red cedar are notorious for having higher concentrations of natural oil in them as compared so many other woods. Until some of this oil has disappeared there is nowhere for new oil to go. Especially with redwood consider waiting until the two tone colors begin to fade or turn gray (often around a month after installation). 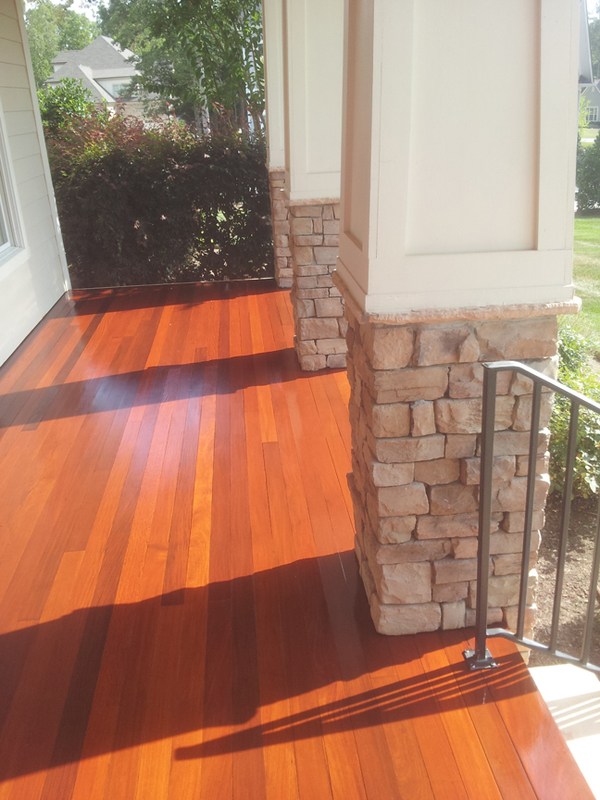 Typically we see transparent stains being used on redwood so that the homeowner can enjoy the colors of the wood. Stain will go on much thinner on new wood than older wood. A thin transparent stain have limited UV protection (pigment is what absorbs UV radiation) as compared to stain that goes on thicker with older wood resulting in premature graying as far as the owner is concerned. Additionally note that the wood will eventually turn gray. Once this happens the two tone look of redwood can only be restored with sanding. ALWAYS follow a wood manufacturer’s recommendation for the timing of staining new wood. This way if there is ever a problem with your wood the manufacturer cannot argue that you did not do as they said. 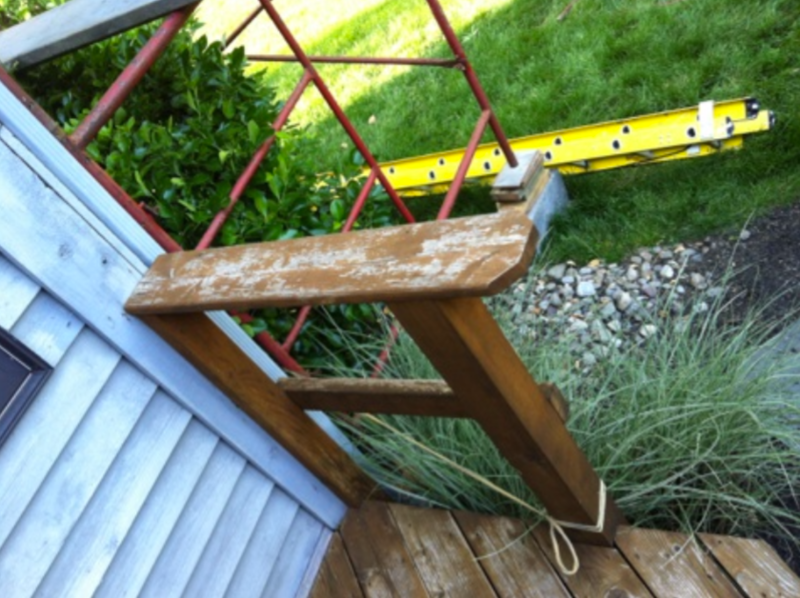 Read “PRE-STAINNG & BACK PRIMING” down below if pre-staining new wood. Consider waiting until the following spring before staining wood that is installed in the late summer or fall to allow the wood to "weather". This gets you on a spring time staining schedule and allows you to enjoy your wood when it looks its best. PRESSURE TREATED WOOD: Generally need about six months after installation before staining. EXOTIC HARDWOODS: Generally need about six months after installation before staining. CEDAR: Generally needs 2 to 3 months after installation before staining. Wood that has been aged and untreated for a significant amount of time is most likely to have layers of gray, decayed, and loose wood fiber. If these fibers are stained, there is a risk that these fibers will take the stain with them as they are displaced from the wood. The result is the appearance of stain failure when in fact it is the inability of loose fibers to remain intact. To prepare you must first clean the wood. Once the cleaning process is complete, the wood most likely should get a light sanding at the very least to help remove the loose would fibers to ensure longevity of the stain. Older wood will not have only lost its original moisture, but much of its natural oil. Armstrong-Clark oil based wood stains are designed to be a one coat application. However, if the first coat of stain absorbs into a soft wood in 60 minutes a second coat can be applied for extra protection. Typically older wood is thirsty for two coats of penetrating oil. If the applied stain does not all absorb into the wood within 60 minutes, do not apply a second coat. This is the wood telling you it cannot accept any more stain. The second coat can be applied wet-on-wet or wet-on-dry. We recommend wet-on-wet. This second coat will also darken and enrich the color. NEVER apply a second coat to hardwoods. Most stains other than Armstrong-Clark oil based stains require that the previous coat of stain be removed using a chemical stripper before applying a maintenance coat (application of stain 18-24+ months after initial application). Failure to remove the previous stain will result in absorption and adhesion failure. Following the stripping process a brightener needs to be applied to neutralize the caustic pH of the stripping chemicals while also bringing back a more natural blonde color to the wood which is darkened by stripping. Wood previously stained with Armstrong-Clark does not require the use of strippers. Clean with a solution of 1 part liquid bleach and 3 parts water and a squirt of liquid dish detergent. This solution will act as a light stripper while also killing any mold and mildew spores. Application of a brightener is not necessary with a thorough rinsing of the wood. Always test for color before proceeding with a job with a sample can. All colors are intermixable to create your own custom colors. Wood moisture content must be 20% or less as determined by a moisture meter; 15% for cedar shingles and redwood to help prevent tannin bleed. If you do not have a moisture meter, touch ends of wood and feel if damp. If damp, wait. Do not apply with a rag. Brush out any puddles before clean-up. Do not wipe applied stain after application. The soaking in period is 24 hours. Only wipe if there are wet spots after 24 hours. If puddles are more like "thick wetter" spots due to over application consider waiting another 24 hours before wiping. Place rags in a metal container with water after wiping for at least one week to prevent spontaneous combustion. An empty stain can can be used for the metal container. See specific application instructions below. There are several common environments and conditions that can accelerate the deterioration of stain. For example, chlorine from a pool, sea spray from the ocean, and sprinklers. Chlorine and sea spray will deteriorate most stains and there are a limited, if any, solutions to these problems. In a way they are what they are. Sprinklers however are something we can control. The constant spray they provide will eat away at stain a little bit every day. The solution is to either turn the sprinklers so that they do not spray onto the wood, or purchase new sprinkler heads that provide a spray in a way that the wood does not get wet. Before starting the process of preparing wood for stain application a homeowner needs to understand the importance of testing for moisture content, stain absorbency, and color. The importance of measuring moisture content is to understand how much water is in the wood. If too much water is in the wood, not only will a stain not be able to penetrate down into the wood, but there will be adhesion failure due to excess moisture still leaving the wood. With high moisture there is nowhere for stain (especially oil based stains) to penetrate down into. Additionally, as the moisture leaves the wood the wood shrinks down creating dimensional instability. The best way to test for moisture is with a moisture meter. If you do not have a moisture meter, touch the ends of the boards to feel for dampness. If the ends feel dry, then test for absorbency. There are two moments that wood must always be tested for moisture content in the wood staining process. When new wood is installed prior to the initial staining. The climate, type of wood, and treatments wood receive at the mill can affect the length of time it will take wood to reach the appropriate moisture content. Prior to stain application after cleaning and preparation are completed. Wood will absorb water in the cleaning process and must dry out prior to staining. Most stains require a moisture content of 15% or less. 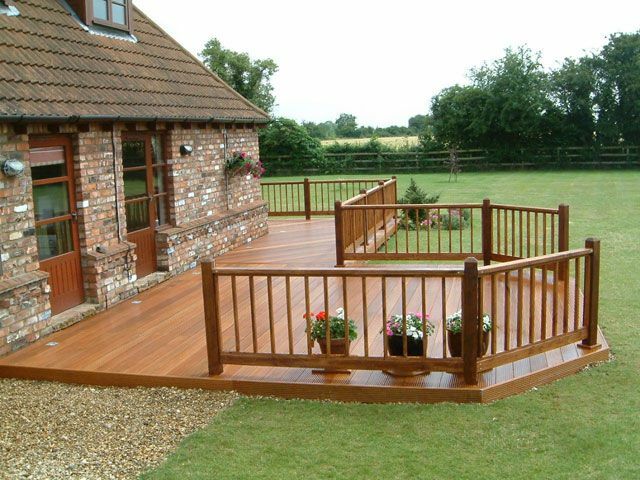 With Armstrong-Clark oil based wood stain you are able to apply stain with 20% moisture or less. However, on cedar and redwood shingles 15% or less is recommended to help reduce the issues with tannin bleed which result in black stains. Excess moisture can help initiate additional bleed. Testing for absorbency is to test how much stain will penetrate down into and remain on the wood. In addition to excess moisture preventing stain penetration, closed pores, mill glaze, and pressure treatments will also prevent stain from being absorbing. Even with low moisture there may still be an absorption challenge. The Sprinkle Test: Sprinkle some water on your wood. Initially on new smooth cut wood the water will bead up. Water and stain absorption into wood is similar. If the beads absorb into the wood within two to three minutes then you are good to go. If not, wait one month and try again. NOTE: For exotic hardwoods absorption will be limited even with aged low moisture wood. 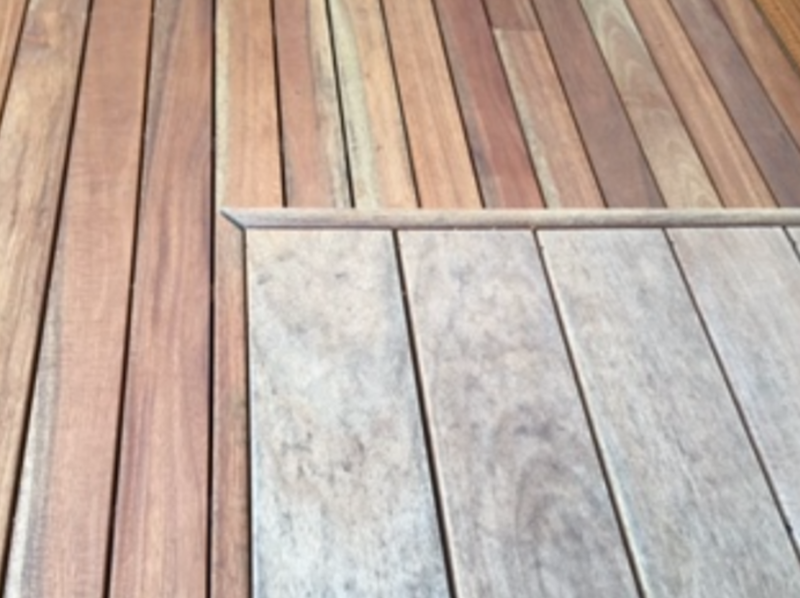 This illustration depicts the difference in absorption between older wood and brand new wood. The older wood absorbed the water almost instantly while after 3 minutes the water beads only slightly grew and size and barely started absorbing into the wood. Different species of wood have different cellular structures, natural oils, and natural coloring, all of which affect color and how a stain is absorb. Within the lumber of any given species there is lighter colored sapwood in the outer growth rings and the darker colored heartwood in the inner growth rings. As wood ages the natural oils and water leave and the pores open up. Some cleaners and prep processes whiten wood while others will blonde (yellow) wood. Therefore, the age and species of the wood, the preparation method used to prepare wood for staining, and the transparency of the stain itself will all affect the final color of an applied stain. NEVER assume a photo on any type of wood will result in the same color on your wood. Always test for color by applying a test sample to an inconspicuous spot on your wood. Inconspicuous locations include locations where planters, tables and chairs, storage bins, or door mats may be placed. Many people make the mistake of testing for color before they prepare their wood. 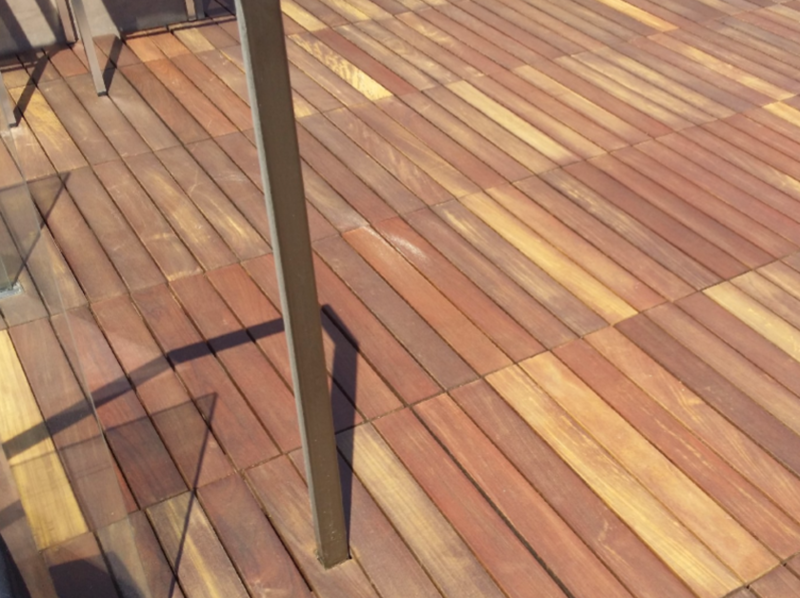 How you clean the wood can dramatically affect final color. If you are very particular about color you may want to consider doing small preparation tests on your wood and then conducting color tests with our sample cans. Example 1: This is a picture that illustrates how different wood preparation processes can actually affect color on the very same piece of aged and grayed wood. The top row is untreated and the color was consistent all the way across. The middle row shows the wood after cleaning. The left side was prepared with bleach, water, and liquid dish detergent. The middle was cleaned with just liquid dish detergent and water. The right side was prepared with a cleaner/ brightener. All sections were stained with the exact same Mahogany stain. Example 2: This photo is of newly stained ipe. It is beautiful and the customer was very happy. Notice the orangish hue of the stain. This was the result of using a brightener on aged wood in the prep process. Some people do not like this look and want a deeper red or brown which could have been achieved by cleaning with bleach, water, and soap with a very thorough rinse. Example 3: Would you believe this is Sierra Redwood? Before wood can be stained, it must always be properly prepared. Unstained wood (new or aged) must be cleaned to insure proper penetration and adhesion of stain while preventing mold and mildew growth. Wood previously stained with most other stains in the market place must be stripped and brightened. One of the more important considerations in cleaning wood is the presence of mold, mildew, or algae. Regardless of whether or not these can be seen on new wood, new wood should be treated as if it had these growths. New wood is often stacked and bundled while there is still a lot of moisture in the wood. Sometimes this wood is wrapped in plastic which creates a greenhouse effect for hidden mold and mildew growth. 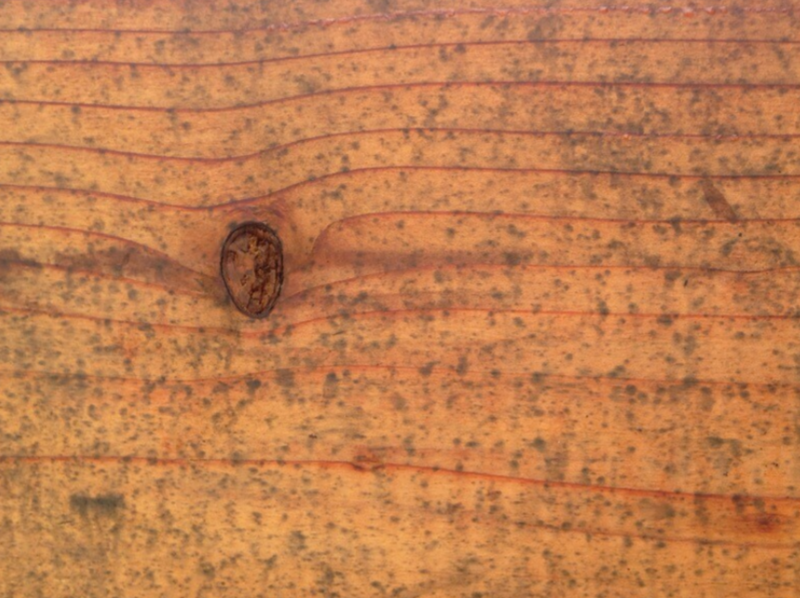 Although the growth may not be visible, there is a very good chance that live spores are present on the surface of the wood. Unfortunately too often a customer will not pretreat new wood before staining and then soon after application finds out the hard way how explosive growth can be. The easiest and cheapest way to prepare new, untreated, or wood previously stained with Armstrong-Clark is with a 1.5% to 2% bleach solution (and no more than 3%). To achieve this mix 1 part bleach with 3 parts water. To this add 1 good squirt of liquid dish detergent per gallon. Do not mix more than ¼ cup of detergent per gallon as you will spend a lot of time rinsing out the suds. Bleach doesn’t clean – it disinfects which is why we recommend adding soap. Specifically we recommend liquid dish detergent (not hand soap) because it is designed to cut grease and grime. Hand soap will not cut grease. We also recommend using Dawn as some liquid dish detergents can be too "soapy". Additionally, the soap will help the bleach hold to vertical surfaces. DO NOT let this mixture sit on the wood for more than 20 minutes as it will damage the lignin in the wood. DO NOT let this solution dry on the wood. Typically we recommend letting the solution sit for 3 to 5 minutes, test scrub, and then hose off thoroughly or rinse with a light power washing. If there is any mold, mildew, or algae remaining after cleaning, you can spot treat and re-rinse. To kill mold, some companies recommend a 1:1 water to bleach ratio. Our recommendation is to use the 3:1 ratio mentioned above to reduce the liquid bleach's damaging affects to wood while still killing growth. As long as you thoroughly rinse wood cleaned with the 1 bleach: 3 water solution you shouldn’t have any stain absorption or adhesion issues with Armstrong-Clark oil based wood stain. This prevents the need for additional time and expense in preparing wood. Additionally, this solution also tends to work as a "light stripper" between Armstrong-Clark stain which saves you money from having to purchase additional strippers and brighteners. Wear protective gear to protect eyes and skin. NEVER mix oxalic acid/ brightener and bleach - a harmful and toxic gas reaction occurs. Do not mix liquid bleach and oxygenated bleach (sodium percarbonate) as they will accelerate a reaction rendering your chemicals useless. Do not use excessive scrubbing, spray pressure, chemical strength, or chemical dwell time as you can damage the wood resulting in furring or raised grain. Always clean wood, even if new, before staining. Click here to download and print a chart summarizing how different cleaners are used. There are two predominate types of cleaners in the market place – liquid bleach (sodium hypochlorite) based and oxygenated bleach (sodium percarbonate). In addition to cleaning wood prior to staining, often we need to consider mold, mildew, and algae and making sure any live spores are killed. Liquid bleach (sodium hypochlorite) based cleaners formulas include a surfactant (soap) to help with the cleaning process because bleach by itself is not a cleaner. Mild scrubbing is required with these cleaners for best results, and they can be either rinsed off with a hose or with light power washing. These cleaners are not as good for cleaning as oxygenated bleach cleaners, but are superior for killing mold, mildew, and algae. There has been much debate over using liquid bleach on wood because of how it can destroy the woods lignin (the woods glue that holds it together). If left on wood too long, or if too strong of a concentration is used, the solution can damage the lignin in wood resulting in fuzzing, poor adhesion of stain, and further degradation of the wood. Lastly, bleach can eat away and rust nails and screws in your wood. Oxygenated bleach (sodium percarbonate) formulas have a fizzing action that helps lift and loosen dirt and contaminants embedded in wood without the need for scrubbing. These are powder based products that require warm water in mixing and have a limited lifetime once mixed. Usually these cleaners are not harmful to wood or plants, and in recent years they have been regarded as having the best cleaning results. Typically these cleaners claim to treat mold and mildew. However, from all the feedback we have received from professionals in the wood restoration industry, at best they will kill mold and mildew only if there is a light growth, but not for heavier concentrations. It is important to note, NEVER add liquid bleach to these cleaners for better mold/mildew killing action. This results in a chemical rendering your chemicals useless. A third and final type of cleaner are Cleaner/Brighteners. These are cleaners that combine a brightener (oxalic acid) into the formula for an all-in-one cleaner and brighter. These cleaners work well when brightening is desired and the mold and mildew growth isn’t in a heavy concentration. There may be some compromise in results to the two-step process of oxygenated bleach and brightening process, but overall typically provide satisfactory results for the average homeowner. It is important to know that bleaches are caustic chemicals and raises the pH of the wood. Liquid bleach artificially whitens, or grays wood while oxygenated bleach does not. For these reasons the wood restoration professionals will always apply a brightener with either option to bring back more of the natural blonde color of the wood, and neutralize the pH higher pH from residue absorbed into the wood. WARNING : Wear protective gear to protect eyes and skin. NEVER mix oxalic acid/ brightener and bleach - a harmful and toxic gas reaction occurs. Do not mix liquid bleach and oxygenated bleach (sodium percarbonate) as they will accelerate a reaction rendering your chemicals useless. See "In-Depth Topics > Pre-Stain Testing > Testing for Absorbency > Testing For Color" to better understand how you prepare wood affects final color. Tannin (tannic acid) is a water soluble extractive in woods including redwood, western red cedar, incense cedar, and others. It appears as a reddish brown to almost black stain (diffuse extractive bleeding) or streak (run-down extractive bleeding) in wood. Often you see it in cedar shingles. It can also be seen in redwood, especially newer redwood that starts looking blotchy or stained once a coating has been applied. The unfortunate news is that there is nothing you can do to remove tannin from the wood or completely prevent it from bleeding out. At best you can remove the tannin stains by applying a brightener once an applied stain has been removed. 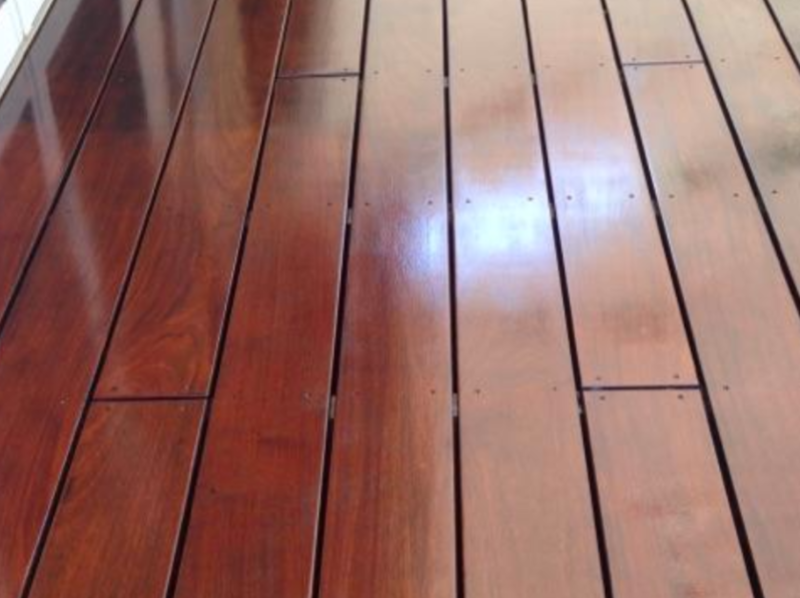 Excess moisture or water penetrating into wood will bring tannins to the surface of the wood. For siding water may find its way behind shingles or into poorly sealed shingles from the exterior. Back-priming (priming the back side of wood) is a common practice prior to installation to help prevent moisture intrusion on the back side of wood, often with siding. This would also be a good practice if you have horizontal wood surfaces close to the ground or in humid climates where there is poor ventilation underneath. Additionally, you want to stain these woods when moisture content is 15% or less. Although oil is not water, it too can induce bleeding and staining. It is advisable to wait at least a month after installing wood before staining the wood, even if the moisture content is at acceptable levels. Proper cleaning is required before staining. Another source of tannin staining comes from leaves and twigs from trees that have fallen onto wood surfaces and have not been removed in a timely manner. Be sure to sweep off horizontal wood surfaces regularly. The best solution to remove tannin stains once they appear is to clean (or even strip if already stained) the wood and apply a brightener with oxalic acid as part of the wood preparation process before applying stain. 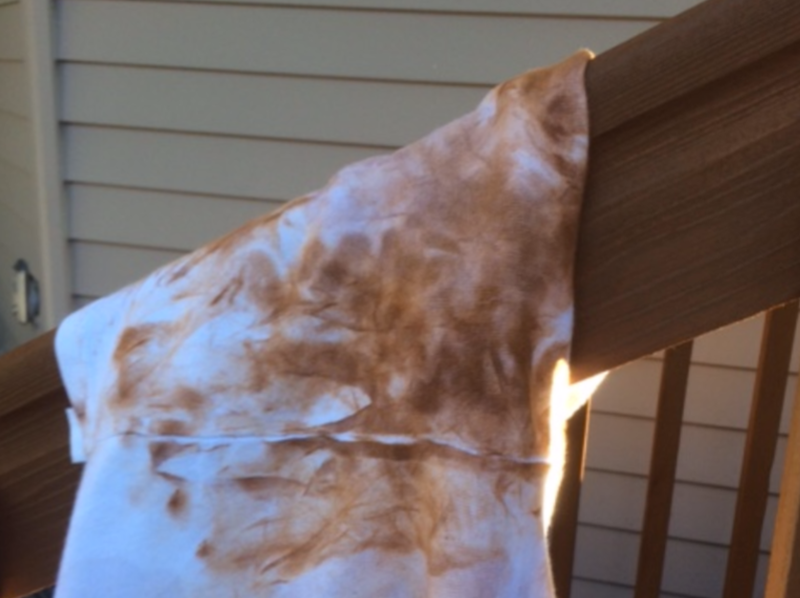 Tannin stains can sometimes be incorrectly identified as mildew or mold. There is a very simple serious of steps that can be taken to confirm which you are dealing with. 1) With a wet rag rub the surface of the stain to determine if it is on the surface of the stain or underneath. If it is on the surface than you are dealing with mold or mildew. 2) If wiping doesn’t work, use a piece of sandpaper to rub through the applied stain to the affected area. Wipe with bleach. If after anywhere from a few minutes to 10 minutes the black stain disappears you are dealing with mold or mildew. If it doesn’t disappear you are dealing with tannin. Pitch is a yellowish brown sap that is often found coming out of knots in woods like Southern Pine or Douglas Fir, especially once it gets warmer. If it is still gooey it can be removed with turpentine or mineral spirits and a rag. If it has gotten hard you can remove it with a putty knife. Unlike Armstrong-Clark wood stains, most wood stains require stripping prior to an application of a maintenance coat. Most strippers on the market today use caustic chemicals like sodium hydroxide that raise the pH and darken wood. These chemicals are not good for your skin, plants, or paint on a house. If you know what stain is on your wood it is probably a best practice go back to the applied stain manufacturer to find out what stripper to use. Otherwise you may want to talk with your local dealer about a best recommendation for your circumstances. Also note that these chemicals can "fuzz" wood if they are too strong or left on the wood too long. Always read the container for application and precautionary instructions. Typically, you want to wet down the wood for a wet-on-wet application. Be very careful when applying stripper with a sprayer not to get the spray anywhere you do not want it, especially on painted surfaces like the side of a house. We would recommend taping off and covering painted surfaces when stripping. Even if you are careful to contain the spray during application, you may not be able to control chemicals that may get sprayed or splashed off the surface during the rinsing process. This can be especially damaging when power washing where spray may rise high enough to take the paint off window screens. When it is time to rinse you can test scrub a small section to see if you need to let the stripper sit a little longer before you rinse. Sometimes a second application of stripper is required. When using a stripper, there is no need to use a cleaner. Typically there shouldn't be any mold after a stripper is applied. However, if wood was not properly prepared before the prior application of stain, mold may have grown underneath the stain leaving residual mold even after using a stripper. In this instance, spot treat as needed with a 3:1 (water:bleach) solution until mold is gone. Hose off thoroughly. It is important to understand that the stripping process takes moisture out of wood. If you apply a caustic stripper, you must always apply a brightener which is slightly acidic to neutralize the pH of the stripper. Apply the brightener while the wood is still wet after rinsing off the stripper. The brightener will also lighten the wood back up from the darkening as a result of stripping. Oil based wood stains like Armstrong-Clark will replace the moisture removed in the stripping process. WARNING! DO NOT mix Bleach with Stripper! There is an adverse reaction. Brighteners are acidic formulas typically containing oxalic acid used to treat wood. Sometimes they also include other acids like citrus. Their acidic pH neutralizes the caustic pH left in wood from strippers and many cleaners. They also return a more "natural" or blonde color to the wood. Below is a list of appropriate uses for brightener. However, there are instances when you may not want to apply brightener where certain colors are desired. Those are detailed further down below. WARNING : DO NOT mix bleach with brightener. There is a very harmful and unhealthy chemical reaction. If you apply a stripper. (There are a limited number of strippers that do not require neutralizing). 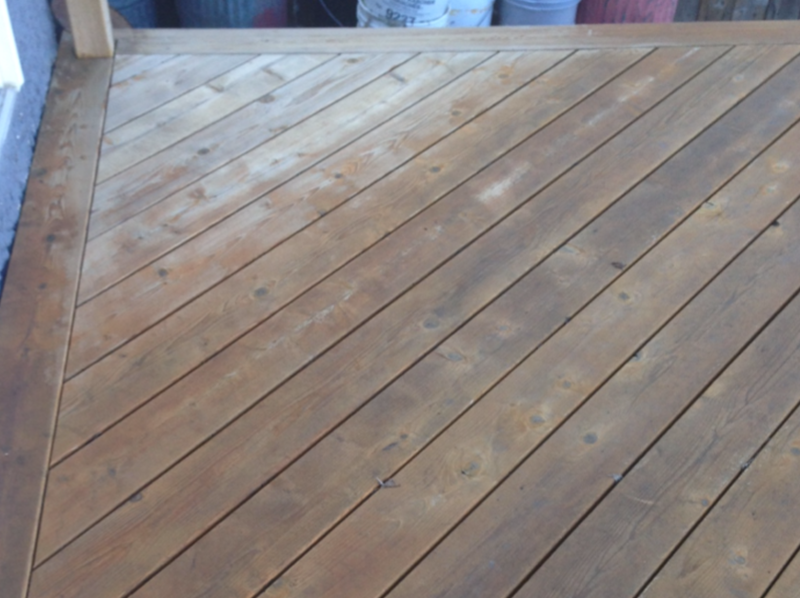 If you have aged/ grayed wood that you have cleaned and you want a more natural color restored before applying stain. For new wood, you can apply to cleaned wood to help open the pores of the wood and remove mill glaze to help with the absorption of stain. Results may be negligible depending on the wood and environment. To remove tannin stains that bled out from the wood, or from leaves and sticks that sat on the surface for any significant amount of time. When trying to match older gray wood to new wood. Bringing back some of the natural blonde of the older wood will help some, but the absorbency into the older wood will still be very different. If any caustic cleaner is used other than just strippers. This would include bleach. 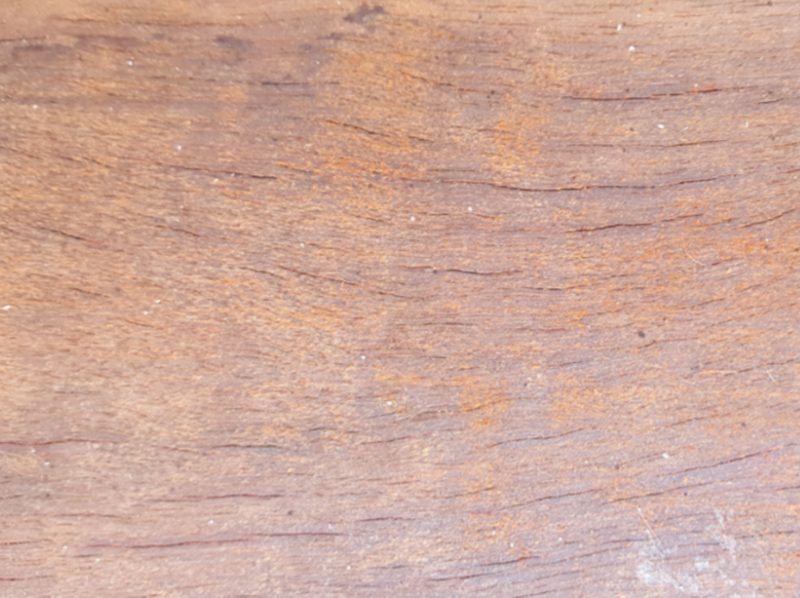 However, we have found that if wood is thoroughly rinsed after using a light bleach solution there have not been absorption or adhesion problems with Armstrong-Clark stain. The two circumstances where you may not want to use a brightener are either achieving a deep rich mahogany color on aged and grayed exotic woods like Ipe, or applying the Driftwood color on aged and grayed wood. 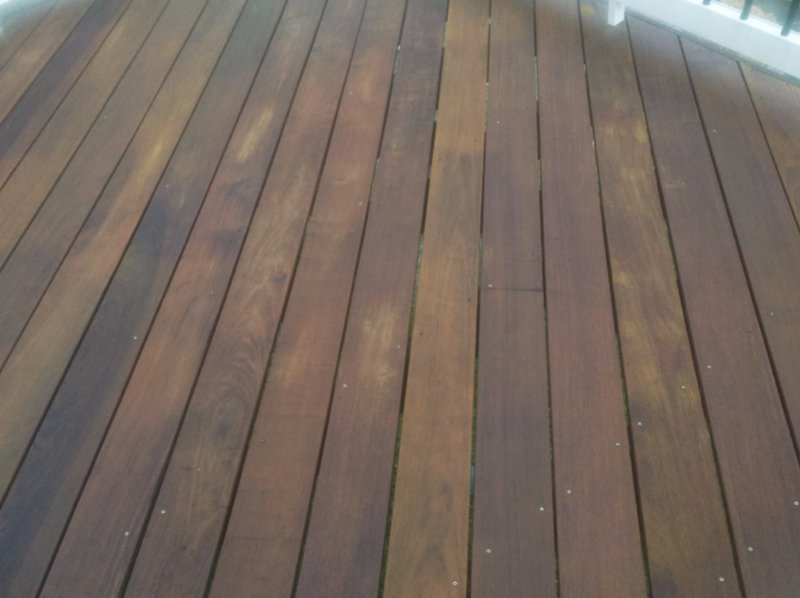 For these instances we want to apply stain to wood that has recently been grayed. If the wood has not been cared to for a significant time, the wood should be sanded to remove the dead and loose wood fibers. Be careful not to sand so much you return the "new" wood look. 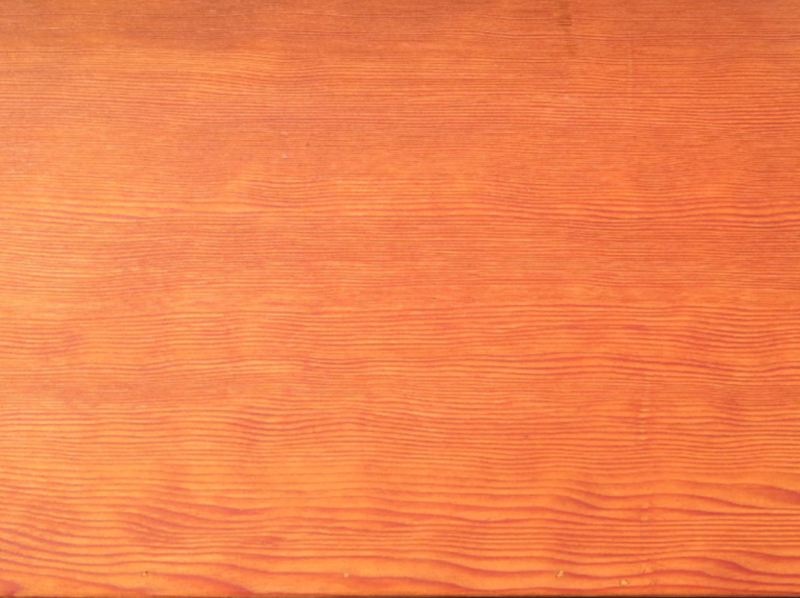 Mahogany color stain on IPE (ironwood, etc...): Most people want the color of their stained IPE to look like IPE when it is wet. Applying a brightener will return a blonder (more yellow) color to the wood. This in turn shifts the color of an applied stain from a deep, rich red to a red that appears more "orange". 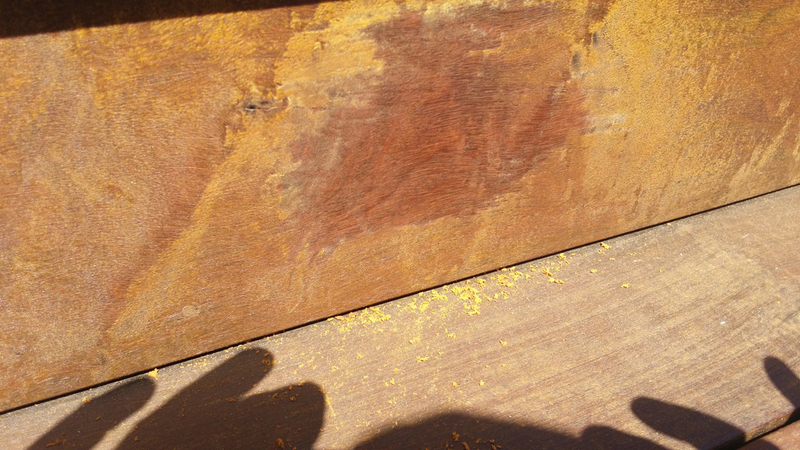 Red stain on grayer wood = Deeper Red/Brown, Red Stain on yellow wood = Orangish Red/Brown. Unfortunately if a stripper is used you must use a brightener. Applying the Driftwood color: We find that most people who are applying this color are doing so because they want the look of aged wood. Applying a brightener and restoring the woods more natural, blonder color is a direct contradiction of the desired goal. This process yellows up the color of the applied stain. As a result additional coats are needed to help bring back a more natural gray look, often not to the final satisfaction of the customer. The information below summarizes the information contained in the Killing Mold, Wood Cleaners, and Applying Brightener sections of this website. This is our recommended method that works for new and aged wood unstained wood, and wood previously stained with Armstrong-Clark oil based wood stains with good cleaning and superior mold, mildew, and algae killing results. This is a best strategy if brightening is not desired, and simplicity is the goal. Especially recommended for applications of Mahogany colored stain on exotic hardwoods like Ipe that have not been previously stained with another brand of stain, or applying Driftwood on aged softwoods. Wood that is previously stained requires stripping. With limited exception, stripping requires brightening. This process can be used on wood even if wood doesn’t have a previous stain present, especially if dealing with mold or mildew, and tannin or rust stains. It can also be used on new wood to "beat up" the wood a little for better absorbency. NOTE: When using biodegradable strippers the stripper may degrade, but stains like latex or acrylic that you are removing will not. Essentially the same results as above but it will cost you a lot more money. These may require the use of Brightener. These work best especially if tannin or rust stains are present on the surface of the wood and there is not heavy mildew, mold, or algae growth. Often we see these systems used on either new wood, or aged wood where there is little to no prior stain remaining. These systems are typically friendlier to plants and bushes. This process is also recommended when a natural or blonde color is returning to the wood is desired. The natural or blonde color will shift the color of an applied stain toward yellow while a bleached/ whitened wood keeps the applied stain truer to the actual color of the stain. Used when looking for the easiest compromise to achieve both cleaning and brightening. For wood that doesn’t have heavy mold and mildew, but has tannin or rust stains. Utilize the Bleach + Water + Dish Soap option above, but add a product called Jomax. The Jomax reduces the amount of bleach needed and helps the Bleach work more efficiently. This process is almost an essential part of wood preparation in the Pacific Northwest. TSP is often used to clean wood and remove grease stains. However it can make surfaces very slippery and we caution against using it for safety concerns. How much pressure should I use when Power washing? The simple answer is as little as possible. Never use pressure to do the cleaning – chemicals should do the cleaning. Think of using a pressure washer as having a more efficient means to rinse your chemicals. All machines will have different pressure output. For most systems use the lowest pressure output with a 40 degree tip (typically white). Stay at least 12" from the surface, possibly more. Be sure to stop and make sure you are not damaging the wood as you go. When cleaning, avoid lap marks when pressure washing by using a continual motion cleaning in the direction of the grain of the wood. Wear protective gear to protect eyes and skin. Using too much pressure will result in "raising the grain" as seen in this photo. As you can see, many layers of the softer part of the wood have been removed while the harder parts of the wood remain. Often, sanding is not required with preparing wood for stain, but it is recommended. Wood restoration professionals will do a light sanding as a last step before applying stain just to remove any loose wood fibers. Generally speaking, when sanding wood we recommend using 60 – 80 grit sand paper. Once you start going higher than 80 grit you risk sealing the pores of the wood making stain penetration more difficult and less effective. Note that spot sanding (sanding in a small area to remove stain or a mill stamp) will most likely change the absorption of the wood in the area you sanding resulting in a slightly different color than non-sanded areas. Orbital sanders 80 grit may leave circular patterns in the wood. Using 100 grit may help eliminate this issue, but it will impede the woods ability to accept stain. When wood has not been stained, or not stained in a long time, and has aged (turned gray). Sanding will remove the top layers of decayed wood fiber. 60 grit, and no more than 80 grit, will work fine for wood less than 10 years old. For wood over 10 years old you can go down as low as 35 grit initially before finishing with 60 – 80 grit. When there is a preference not to use a stripper to remove a previous stain application, or when a stripper has failed to remove all the previous stain. This is common with latex and acrylic stains. 20 - 35 grit sandpaper would work to remove the majority of the stain initially before finishing with 60-80 grit. To remove wood fur or fuzz. 60-80 grit typically works best. For exotic woods like Ipe use 80 grit, but be careful not to sand down into the wood. 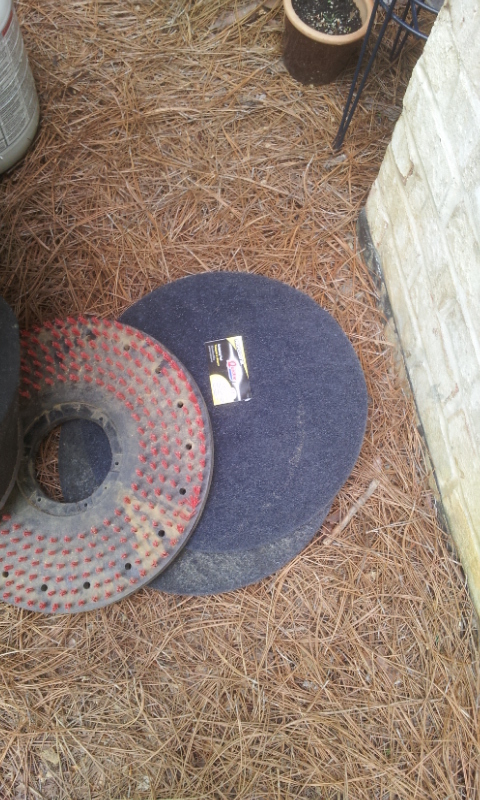 You are only using sandpaper to remove fuzz off the surface of the wood. To remove a mill stamp. DO NOT sand new wood unless removing a mill stamp. This will further close the pores making it more difficult to absorb stain. To remove any splinters and loose wood fibers. The saw dust can be blown or swept off. 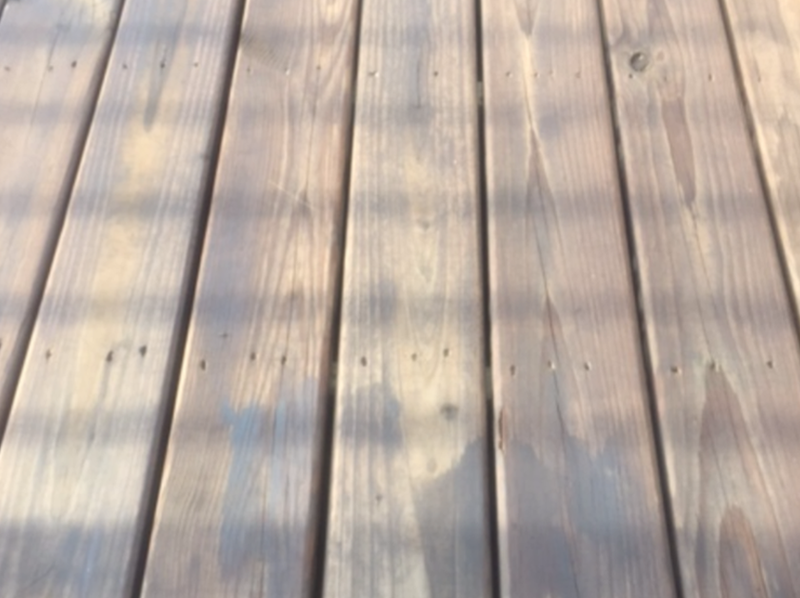 Wood "Fuzz" or Wood "Fur"
To summarize, wood "fuzzies" or "fuzz" are the result of a chemical reaction from the application of a caustic chemical, and wood "furring" or "fur" is the result of a mechanical process of using too much pressure when power washing. Regardless, they look pretty much the same and used interchangeably even by most professionals. "Wood fuzzing" results from an over application of strippers. These are caustic chemicals that will create these "fuzz" if left on wood if applied with too strong of a concentration for a given wood, left to dwell on wood for too long, or a combination of the two. To minimize the chances of fuzz it is a common practice to start with lower strength stripper and work your way up to a high strength stripper as needed. Do not let the chemicals dwell any longer than recommended in their instructions. Pay extra special attention if you have horizontal tongue and groove wood. This can be found in some exterior applications of hardwoods like IPE. Tongue and groove creates the problem of not allowing water to drain. When water cannot drain even a light strength stripper formula can create wood fuzzies because the solution sits longer during the rinsing process. 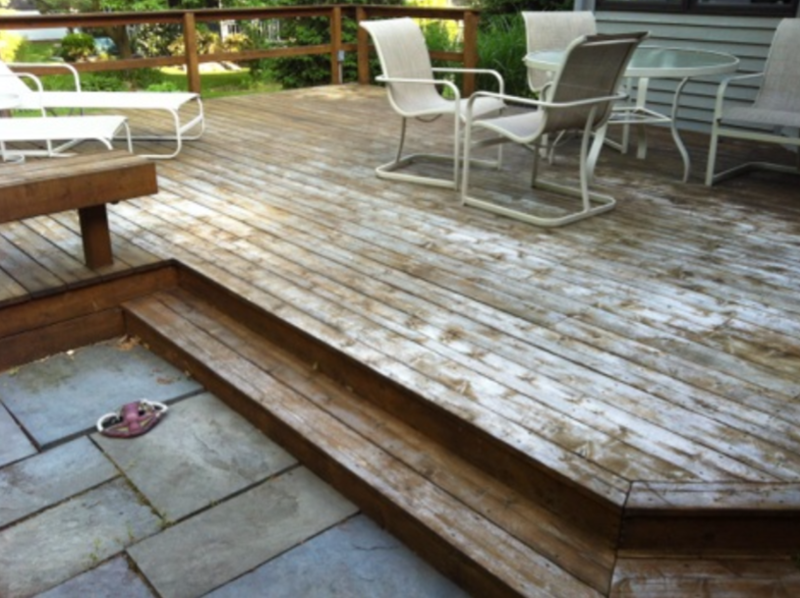 Wood Furring is caused by using too much pressure when power washing. The softer the wood the more careful you need to be. Cedar is a very soft wood and will fur quicker than many other woods. You will want to use a fan pattern with the lowest pressure setting. Often this is a white tip on a power washer. Think of power washing wood as using a higher pressure garden hose. You do not want to use the pressure to actually clean the wood. You want soaps and strippers (depending on your need) to do majority of the cleaning and the pressure washing is just a little extra help to remove the unwanted contaminants. When you use too much pressure you will see small specs of wood coming off. If you see this, back off the pressure and or distance your nozzle is from the wood. 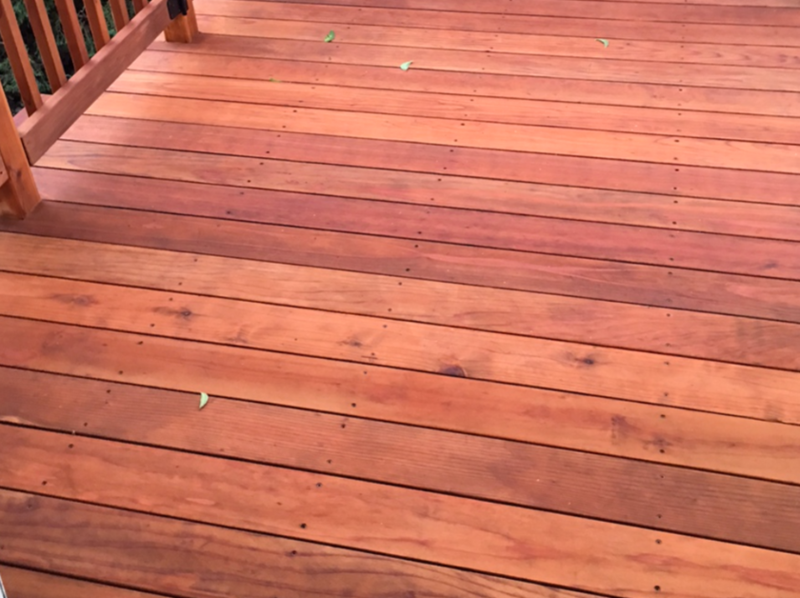 In addition to chemical and mechanical causes of wood fur and wood fuzz in the prepping process, we have seen new wood that has not been prepared with power washing or chemical strippers with furring or fuzzing. We are not sure of the causes of this phenomenon, but we do recommend that you inspect your wood before preparing and or staining to insure that there isn't a larger problem that may be difficult to address. 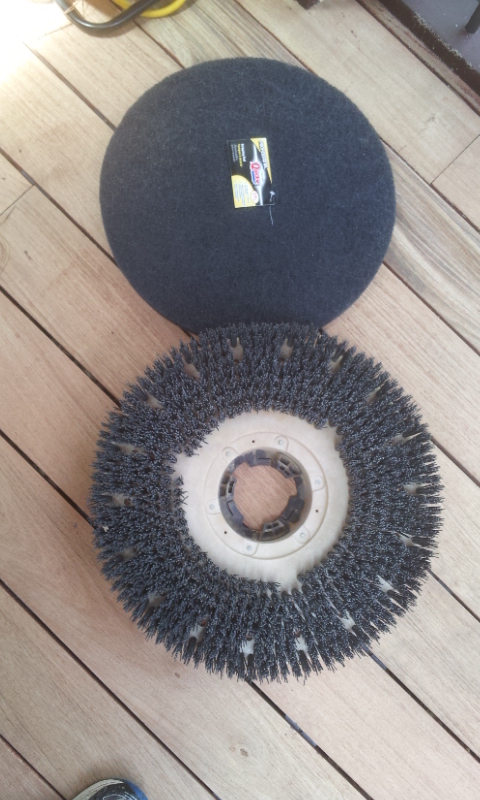 To remove fur or fuzz you can use sandpaper for most woods. For exotic hardwoods like Ipe wood restoration professionals often use defelting pads. If sandpaper is used for these woods it is only used lightly to remove the fur/fuzz, not to actually sand down the wood. Typically about 80 grit should work. If you go much higher in grit count you risk sealing the pores. If you go below 60 you risk removing too much wood. Palm sanders and sanding blocks work well for spindles and tight areas. For variable speed or orbital hand sanders you want to use a slower speed. Always speak with a local lumber expert to review the requirements for your specific wood and circumstances. The day you apply your stain is the best it will look. Over time the stain will gradually fade from UV rays, rain, snow, and traffic. For this reason it is best to get on a springtime application schedule so that your wood looks best during the months you will use it and see it most. However, there may be circumstances in which you need to apply stain in the fall. When this happens, look to try and get on a springtime schedule when starting a maintenance schedule. 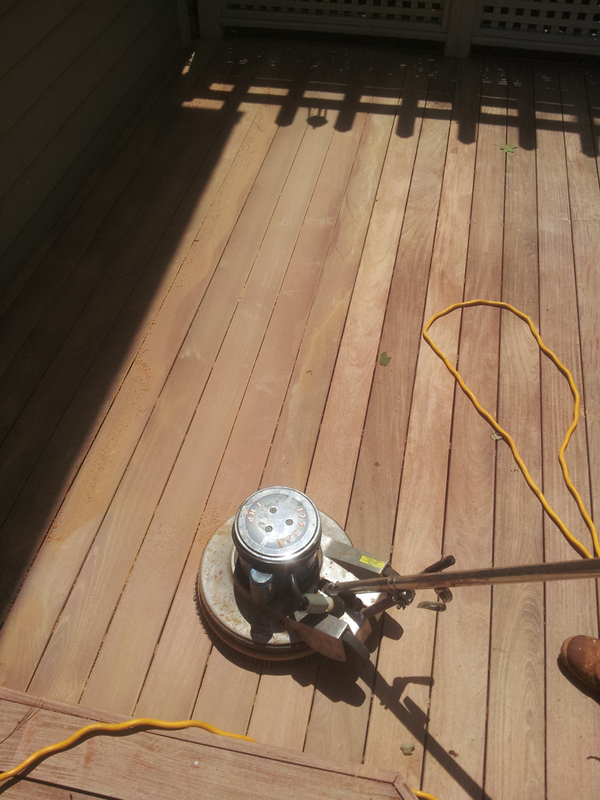 When applying stain in the Spring avoid preparation and application when pollen is blanketing wood surfaces. “Back priming” is the staining or sealing of the backside, or underside of wood. Often people question whether or not this step is necessary. It is a requirement/ necessity when applying wood shingles to keep wind driven rain and moisture coming through an exterior wall of a house from finding its way into the wood and inducing tannin bleed. “Pre-staining” often refers to the process of staining all sides of wood prior to installation. Typically this is done to provide an additional ground moisture barrier when installing decking that is close to the ground or otherwise has poor air circulation, or installing a second story deck where color is desired on the underside. It is recommended for any application where wooden surfaces will be exposed to higher levels of moisture. For example, when a horizontal wooded surface like a deck will be constructed less than 18" from the ground and will not have adequate ventilation for moisture coming up through the ground to escape without having to travel through the wood. Even in these circumstances you may not be able to prevent premature deterioration of wood and adhesion failure of an applied wood stain. 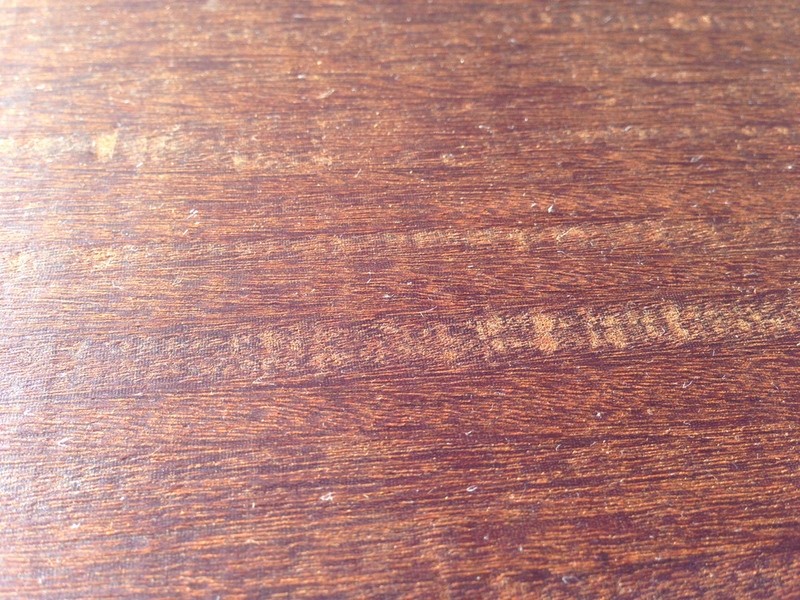 These processes often present the dilemma of staining wood that is not ready to accept stain. ALWAYS perform an absorption test prior to pre-staining, and ALWAYS follow any wood manufacturer’s instructions requiring pre-staining. Additionally note that stain on the top surface of pre-stained wood that is exposed to sun, rain, and traffic may only last a few months. DO NOT pre-stain with semi-solid colors. Many organizations and suppliers of woods like ipe, mahogany, or even cedar recommend staining all sides of wood before installation regardless of application. Especially with exotic hardwoods, stain applied to wood less than four months old will only last a few months, at least on surfaces exposed to sun, rain, snow, and traffic. 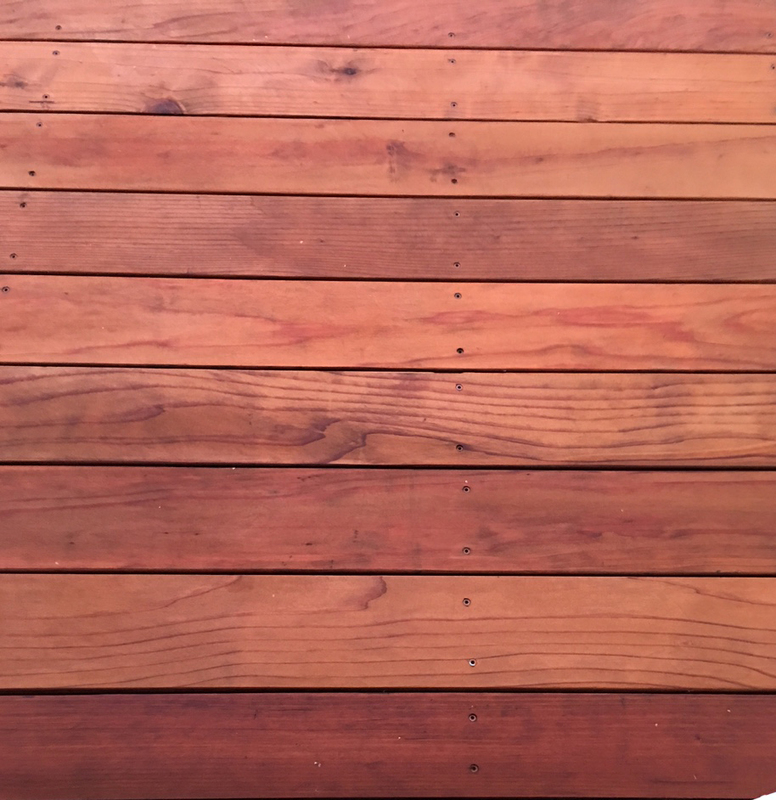 In horizontal applications like decks the stain will last longer on the bottom where it will not be exposed to the elements, but we have not found any testing results showing how long. Stain on the sides of new wood in theory may last longer than the top side, but not nearly as long as the bottoms because they will get exposed to water run-off, dirt, grime, and depending on the gap between boards a limited amount of sun. Pre-staining is sometimes performed indoors, especially in winter months. Staining indoors presents additional drying and curing challenges as there is inadequate airflow as compared to staining outdoors. Dry times can be extended from days to weeks. 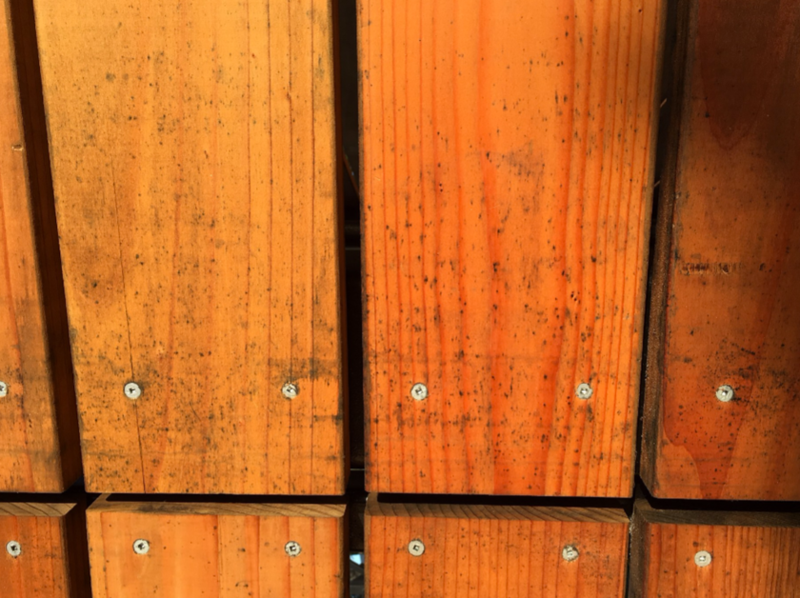 Unfortunately at Armstrong-Clark stain we have not seen any actual testing results on when staining all six sides is needed (or not needed) prior to installation of wood and more research is needed before we can make a recommendation with clarity. Having said that, if you are working in an environment where there is poor air circulation you should probably consider this as an option. We always highly recommend that you talk with a local professional about what is needed for your particular circumstances. Softwoods and Hardwoods typically are very different in absorbing and accepting stain and therefore must be approached very differently. It is also important to note that some softwoods like Douglas-fir are harder and denser than some hardwoods which will also affect how much stain you can apply. Generally speaking, hardwoods only need a single sparingly thin application of stain because of their limited ability to absorb stain. This is because of their dense cell structure. Care must be taken to not over apply stain to these woods. We typically recommend applying with a stain pad or a dual-rolled kitchen sponge mop. For sponge mop application – dip mop in stain pan, do not squeeze out the stain, blot out on wood, and then mop out the stain using the mop like a squeegee. If a brush is used, we still recommend passing over the applied area with a stain pad. Using a pole on the pad makes the process a lot easier than being on your hands and knees. We recommend only apply Armstrong-Clark’s Mahogany or Amber colors to these woods. Natural Tone can be used, however the wood will start turning gray within a few months. Ironically, sometimes graying an exotic wood like Teak is desired. We do not recommend a roller on exotic hardwoods. Depending on conditions, once there has been a two coat application, future maintenance coats of Armstrong-Clark oil based wood stains on softwoods often only require a single coat due to the non-drying oils remaining in the wood from previous applications. Horizontal or Vertical Surfaces First? 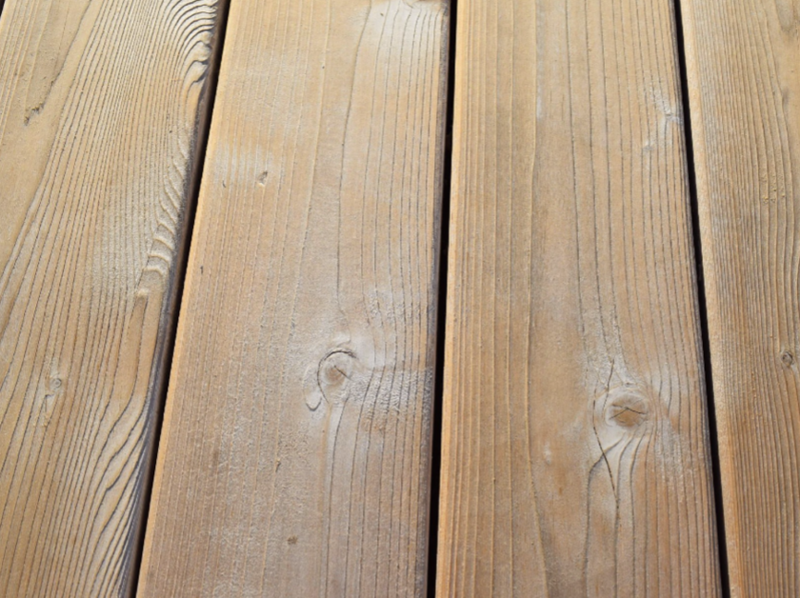 When applying a stain to a deck that has handrails, apply stain to the deck first. 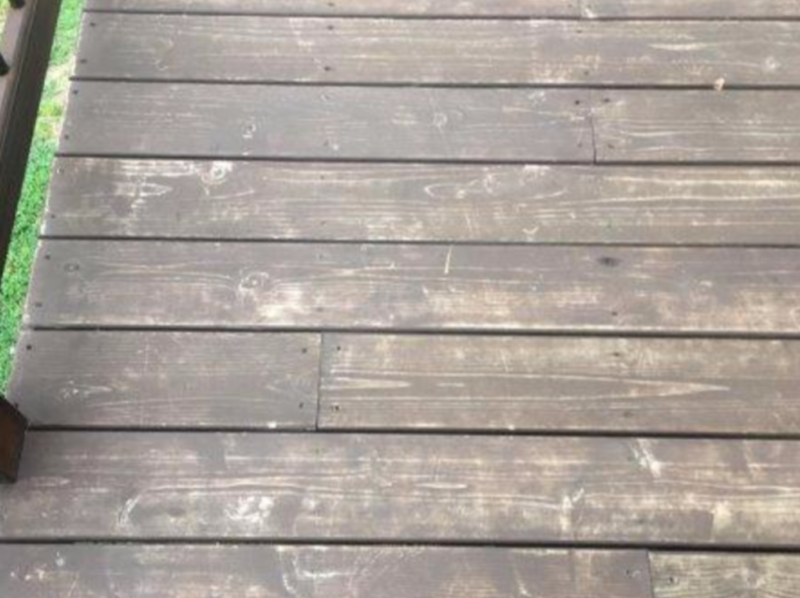 This way when there are drops of stain that fall to the decking you can brush out the drip and blend it into the stain already applied to the deck. Otherwise you would be brushing out a drip without being able to blend it in with any other stain on the board. 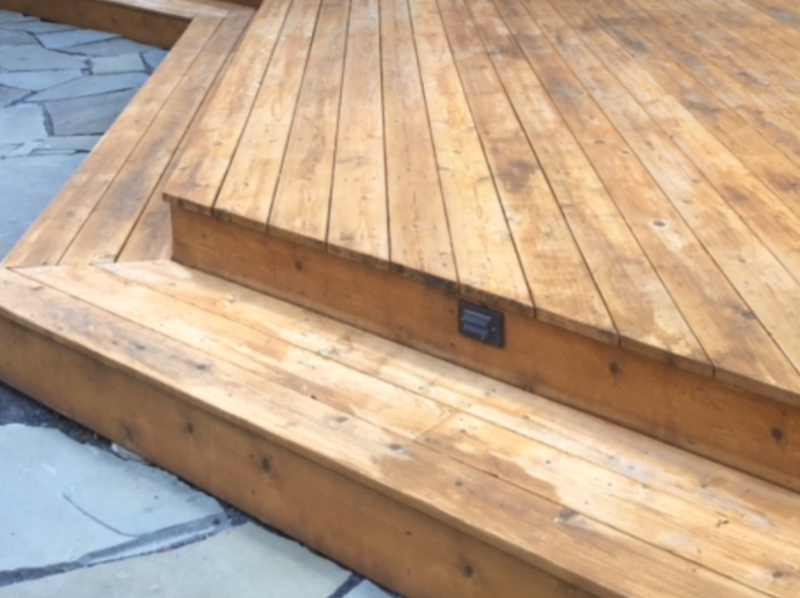 With Armstrong Clark stain you can accomplish this without worry because you can walk on deck boards with applied stain during the application process without leaving footprints. Any footprints that may appear will disappear in the curing process as the oils soak and spread into the wood. It is important to understand that Armstrong-Clark's stain dries with a soft coat. For this reason our Semi-Solids should not be used as there is too much pigment in the formula's resulting in rub-off, especially onto clothes. Our transparent colors can be applied and allowed to dry. Regarding our semi-transparent colors, mahogany, and amber colors the application process is more of a tinting wood process. Furniture and sitting surfaces applied with these colors must have the stain wiped off 60 minutes after application. Never apply Semi-Solids to wood less than a year old or to furniture. Its high pigment content will have rub-off issues. We also recommend using a brush to apply these colors and not a roller. Using a roller sometimes results in application of too much stain resulting in rub-off problems. During the drying/ curing process a tell sign of over application is that there are puddles or shiny wet spots 24 hours after application. Once the drying process is complete, or at least appears complete, over application symptoms include significant rub-off onto shoes and clothes, "chipping" where stain seems to have been removed, and darkening of the wood or stain. Armstrong-Clark does not have anything in it to chip or peel, nor does it have anything in it that becomes sticky or tacky like most stains. However, several months to a year after an over application there will be the appearance of patches of stain that have disappeared. The affect will look as if someone applied tape to the surface and ripped it off quickly. The surface of the wood or stain will also become dark or darker. This is the result of non-drying oil that couldn’t penetrate due to saturation and remains at the surface. The darkness is actually dust, dirt, pollen, etc… sticking in the oil that doesn’t dry. Often you will see both of these symptoms happening at the same time. Most stains cannot be applied in direct sunlight or the heat of the day and usually have a temperature high of 90-95 degrees. This is because these stains are water-based or have high solvent content. Hot temperatures will flash water out of water-based stains quickly and solvents will evaporate quicker. Application of either type of stain can result in thick and gooey application and sticky shiners. A thicker application can also lead to additional and more severe cracking and peeling over time. Application also becomes difficult because footprints from walking on applied stain can be left. Armstrong-Clark oil based wood stain can be applied no matter how hot it is and in direct sunlight without having to worry about the stain become thick, sticky, or leaving shiners. You can walk on Armstrong-Clark stain during the application process without worrying about leaving footprints behind. Any footprints that appear will be short lived as our stain mattes out and absorbs into wood overtime. This is made possible because Armstrong-Clark wood stains are made with a high solids (low VOC) formula. See "Things To Know > VOC's, Solids, and Government Regulation" to learn more about VOC's and solids. Most stains become thick and viscous in cold weather, and some stains have issues with freezing temperatures in the evening. 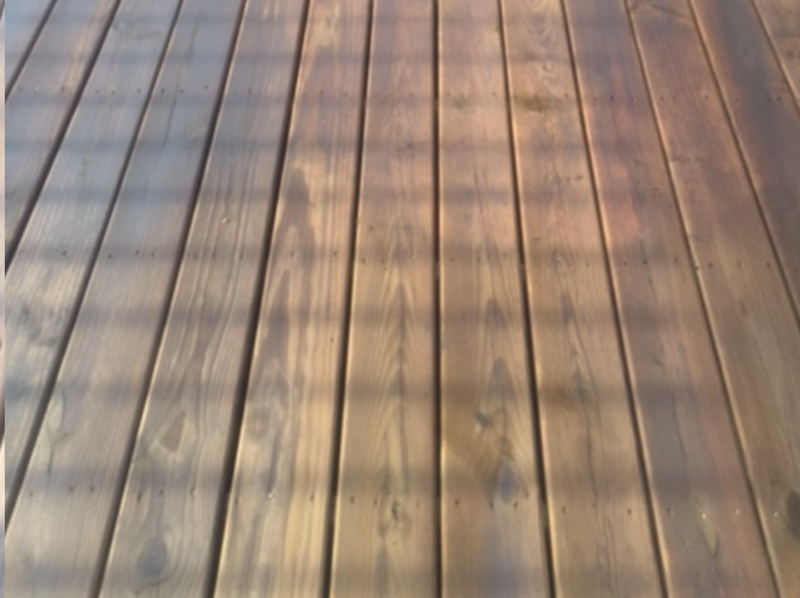 Although it needs to be above 50 degrees for application of Armstrong-Clark oil based wood stain, there are no problems with temperatures falling below freezing into the evening after absorption into the wood. However, cold and freezing temperatures will prolong the drying and curing process. For cold weather, keep your stain inside at room temperature until it is time to apply. This will keep your stain warm and thin to make cooler weather application like it is warm outside. Just wait until the warmest part of the day before applying. This allows time for the wood to warm up some and burn off any morning dew that may have settled on the wood overnight. Just about every stain manufacture warns against applying stain when rainy weather is expected. This can be frustrating for many, especially during the summer when rain is possible just about every day. Some provide ambiguous warnings like "Do not apply when rain is imminent". What does that even mean? What is the time frame of imminent? Unfortunately this often leaves the consumer uncomfortable and filed with panic if they later hear thunder or otherwise get rain. Armstrong-Clark oil based wood stains can be exposed to "normal" rain conditions 60 minutes after absorption into wood (not 60 minutes after application). In some cases this can be as little as 80 or 90 minutes after application. If heavy rain is expected, we still recommend letting the storm pass and letting the wood dry for 2 days (or until moisture content has gotten down to at least 20% or less). For hardwoods you may want an eight hour window of time after absorption as hardwoods may appear to fully absorbed the stain when the process is still not complete. Note: Some images may have a similar appearance (symptom), but may have a different cause. Explanation: When more oil is applied than the wood can absorb the non-drying oils migrate back to the surface where they prevent the drying oils (which carry the pigment) from setting up and drying. The bare wood shows itself where the drying oils were not able to dry and lock in the pigment. Before you start a project conduct a absorption test to make sure your wood is ready to absorb stain. In wood preparation do not use higher than 80 grit sandpaper if sanding. Using a higher grit will close the pores of the wood inhibiting stain absorption. After preparing your wood, use a sample can to test for clior and absorption. Apply the stain in the same manor that you will apply when completing the project. If the first coat takes more than sixty minutes to absorb consider applying less stain and do not apply a second coat. Remember when it comes to stain “More is not better”. We only want to apply an amount of stain that wood will absorb. Click here to learn more about prestain testing, preparation, and application. Solution: The wood will need to be stripped (or sanded) and refinished. Typically we recommend waiting until the following spring before doing any work. Testing is recommended before doing any work to see if there is still water repellency. If water beads do not soak into the wood the interior of the wood may still have adequate oil and a new coat of stain may have challenges absorbing into the wood. Please contact us for specific recommendations to your situation if you have a similar challenge. Explanation: Many decks built on the ground with less than 18” of clearance, poor cross ventilation, skirting (which prevents air circulation) will trap the moisture coming up from the ground. 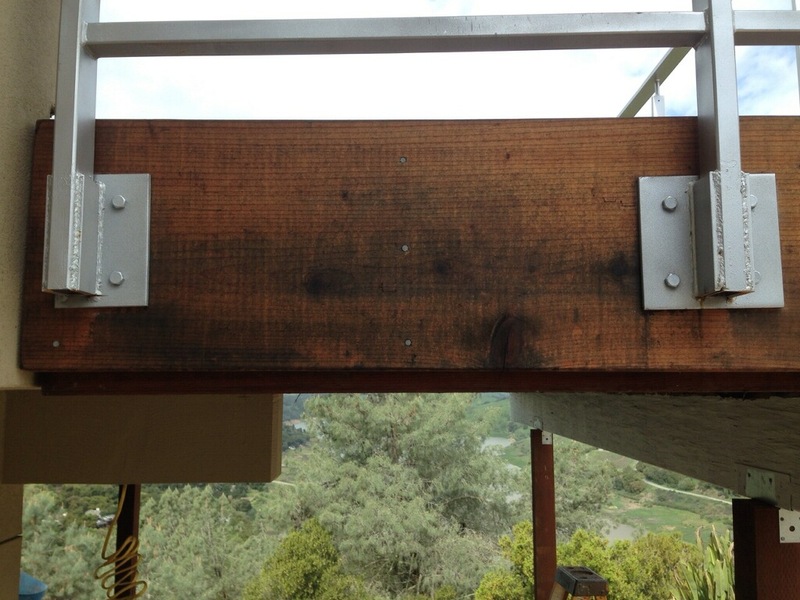 This moisture will then travel up through the wood providing higher moisture content in the wood. The higher moisture content inhibits stain absorption and the ability of the stain to bond with the wood regardless of the brand or type of stain. It is critical that wood moisture content is always checked before stain application. However, even when moisture content is ideal for application, higher moisture content after drying/ curing will breakdown the stain. Prevention: For decks that are already built remove any and all skirting to promote cross ventilation. This may help. Otherwise there may not be much you can do. For decks not yet built seriously consider not building a deck on the ground or a deck with skirting. Where skirting is desired, consider lattice to stll allow air circulation. Additionally, do not prep wood with higher than 80 grit sandpaper. 60 grit may better serve you especially in decks close to the ground to open up the pores more. Lastly, be sure to not over apply the stain during application. Solution: Unfortunately there really isn’t any solution other than what is mentioned in “Prevention”. Moisture is wood and wood stains worst enemy regardless of product or brand. Cause: Staining wood before the wood ready for staining. Applying Semi-Solid to wood less than a year old. Potential other cause includes high moisture content (see other photos). Explanation: New wood typically has a number of factors inhibiting stain absorption which then leads to bare wood exposure prematurely. New wood has higher moisture content that must reduce down to 20% or less. There is mill glaze on smooth cut wood surfaces, the pores of the wood are still closed up, and for pressure treated wood there are the pressure treatment chemicals that create challenges for stain absorption. This conditions compound the absorption problem for semi-solid stains that high concentrations of pigment that sit on the surface resulting in either rub-off or premature disappearing. Prevention: Allow your wood to weather and age. Generally speaking cedar needs 2-3 months, redwood needs at least one month, pressure treated woods and exotic hardwoods need 6 months. Before you stain conduct a water absorption test. Furthermore, properly clean and prepare your wood to remove contaniments and remove mill glaze. Do not apply Semi-Solid stains to wood less than a year old, and once wood is at least a year old do not apply more than one coat of Semi-Solid stain to any surface other than Fire Retardant Shingles. Solution: The wood will need to be properly cleaned and prepped before re-staining once the wood is ready to absorb stain. If a semi-solid is still desired be sure to wait at least one year before re-staining the wood. Cause: Staining wood before six months after installation. Explanation: Exotic hardwoods have a very limited ability to absorb stain, especially when new. Their cell structure is very dense and time is needed for the pores to open up. At best, even when exotic hardwoods are ready to accept stain the stain may only penetrate the thickness of a thumbnail and will last 9 to 12 months. Prevention: Wait 6 months after installation to stain wood. Properly prep and clean wood. Exotic hardwoods shouldn’t need sanding but if sanding is required we recommend using 80 grit and no higher than 80 grit. If the wood manufacture recommends pre-staining the wood before installation, or if the wood has less than 18” of clearance from the ground, we recommend pre-staining all six sides of the wood. The stain on the top surface will disappear quickly, but the stain on the bottom will last longer. Solution: Wait until the exotic hardwoods are at least 6 months old. If the six month mark falls in the late summer or fall we recommend waiting until the following spring. Explanation: There is nothing in Armstrong-Clark stains to provide a glossy look. If the wood appearsshiny you are seeing glare from light reflecting off the oil sitting near the surface of the wood. Although this is rare, this is more common with exotic hardwoods than with softwoods because exotic hardwoods have a limited ability to absorb stain. Prevention: Wait 6 months after installation to stain wood. Properly prep and clean wood. Exotic hardwoods shouldn’t need sanding but if sanding is required we recommend using 80 grit and no higher than 80 grit. 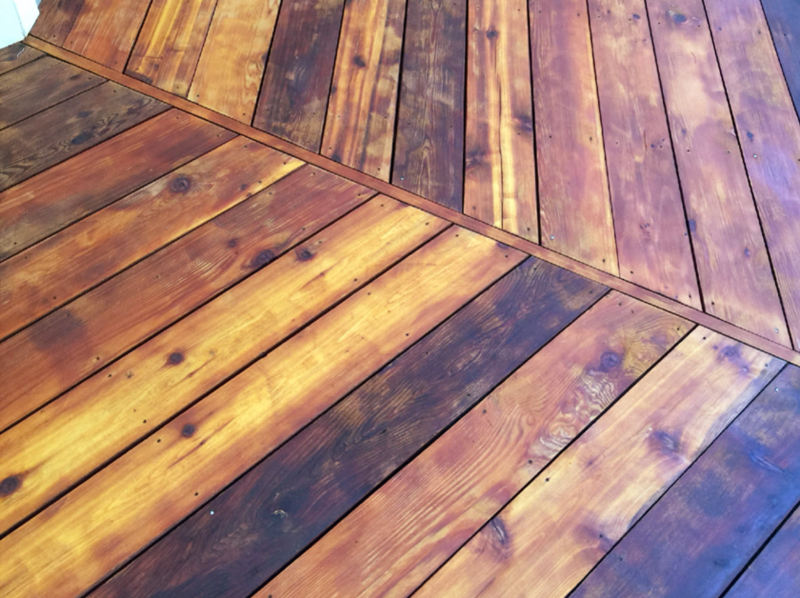 If the wood manufacture recommends pre-staining the wood before installation, or if the wood has less than 18” of clearance from the ground, we recommend pre-staining all six sides of the wood. The stain on the top surface will disappear quickly, but the stain on the bottom will last longer. During application apply a sparingly thing coat of stain. Apply as if you think you are not going to have enough stain to finish the project. We recommend stain pads and dual roll kitchen sponge mops. Click here to learn more about proper application on exotic hardwoods. Solution: If the majority of the surface is glossy use a solution of warm water and a squirt of liquid dish detergent for each gallon of water used. Gently scrub the surface of the wood with a soft bristle brush and rinse thoroughly. The liquid dish detergent will help break up excess oil (similar to grease and fat on our plates) and the soft bristles and gentle scrubbing will prevent furring of the wood, or scratching of the surface stain (as opposed to a stiff bristle or hard scrubbing). If there are only a few glossy spots after 24 hours you can wipe them up with a rag. Also, flood the surface of the wood with water from a hose once a day for several days. Wait about 10 minutes after flooding and then gently rinse the water away. The logic here is that oil floats on water. The oil will float to the surface of the water and the rinse away in the rinsing process. If after three days you still experience some issues resort to the initially mentioned light scrubbing with a soft bristle brush and a liquid dish detergent solution. Applying a heavy coat of stain to new wood. Applying two coats of stain to newer wood or exotic hardwood. Prevention: When testing for color apply the stain just like you will when completing the job. Observe how long it takes for the stain to absorb into the wood. If it takes longer than 60 minutes extra care should be taken to put apply a lighter coat. DO NOT apply semi-solids to wood less than a year from installation and DO NOT apply two coats of semi-solid stains to surfaces other than fire-retardent shingles. Solution: Use a solution of warm water and a squirt of liquid dish detergent for each gallon of water used. Gently scrub the surface of the wood with a soft bristle brush and rinse thoroughly. The liquid dish detergent will help break up excess oil (similar to grease and fat on our plates) and the soft bristles and gentle scrubbing will prevent furring of the wood, or scratching of the surface stain (as opposed to a stiff bristle or hard scrubbing). An alternative method if the wood is less than a year old and only one coat of stain has been applied is to apply a coat of Natural Tone over the stain to help lock in the pigment. We recommend trying this with a sample can first to confirm this will work for your circumstances. 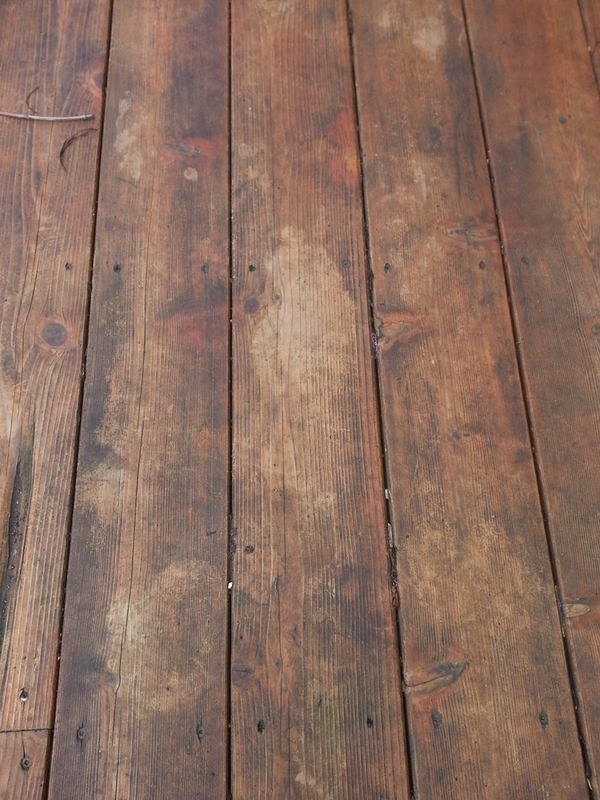 Significant darkening of the stain typically within a few months to a year. Explanation: More is not better when applying stain. When too much stain is applied one of the many potential problems is that the wood cannot absorb all the non-drying oil in our stain. When this happens the non-drying oil migrates back to the surface of the wood. When there is a slight over application just a little oil may be sitting near the surface and still have a fairly matte appearence (as opposed to cases where there is a lot of oil that looks glossy). If not promptly dealt with pollen, dirt, dust, etc… will stick in this oil instead of blowing off darkening the appearance over time. Solution: Flood the surface of the wood with water from a hose once a day for several days. Wait about 10 minutes after flooding and then gently rinse the water away. The logic here is that oil floats on water. The oil will float to the surface of the water and the rinse away in the rinsing process. If after three days you still experience some issues use a solution of warm water and a squirt of liquid dish detergent for each gallon of water used. Gently scrub the surface of the wood with a soft bristle brush and rinse thoroughly. The liquid dish detergent will help break up excess oil (similar to grease and fat on our plates) and the soft bristles and gentle scrubbing will prevent furring of the wood, or scratching of the surface stain (as opposed to a stiff bristle or hard scrubbing) while helping remove dirt. Oil floating in water puddles sitting on the surface of the wood. Cause: Poor preparation Explanation: In the first pictures you can see the uneven removal of a previous coating pretty clearly. There are hard lines on the permiter of the darker areas. This indicates where the spray from a pressure washer did not get all the surface are. This may also indicate that the cleaning method was primarily the use of a pressure washer without the use of proper cleaning/ stripping chemicals or scrubbing techniques required for the specific previous coating. Upon application of a new coat of stain the previous coating not only provided a darker finish where the two coats overlapped, but the prior coating (which was not Armstrong-Clark) may have inhibited the new coatings absorption into the wood. This may have provided further darkening in appearance over time where the non-drying oil sitting near the surface captured all the dirt, pollen, dust, etc… that blew into it over time. Prevention: Use the proper chemicals and techniques for removing any previous coating. 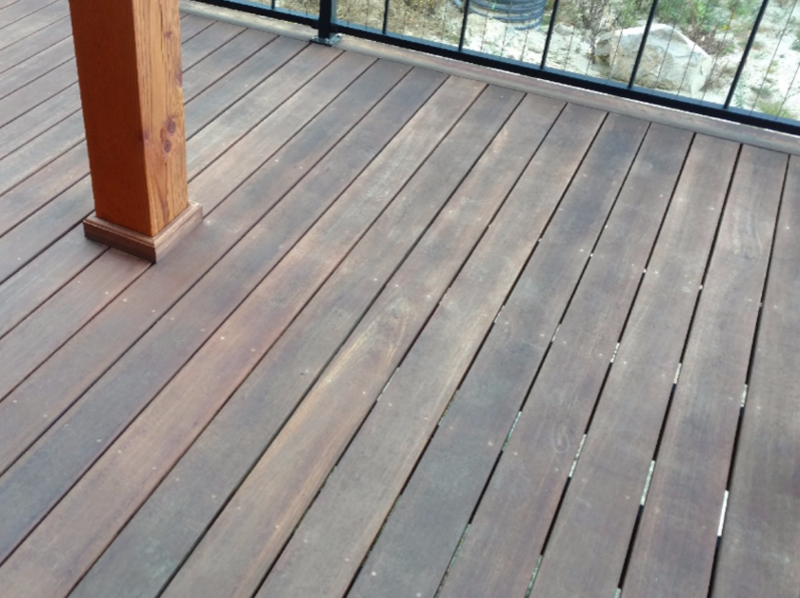 Solution: This deck should be properly stripped, brightened, and restained. If it is late summer or early fall consider redoing the project in the spring of the following year. Explanation: Armstrong-Clark stain is a soft coat, not a hard coat (film forming) stain. The benefit is there is no peeling or cracking of the stain, nor do you need to strip or sand on maintenance coats. However, bleach will act like a stripper in cleaning. Also, because our stain does not create a film excessive scrubbing will remove the drying oil that sits on top of the wood. Lastly, specifically with this photo there appears to be an over application of stain. This is evident because the overall appearance is darkening in some areas. This darkening is cause by excessive non-drying oil that the wood could not absorb sitting at the surface. When this happens the oil catches all the dust, dirt, pollen, etc.. that blows over it over time. This also means that the drying oils weren’t allowed to properly dry leaving a poor bond to the wood. When this happens the stain is more easily removed. 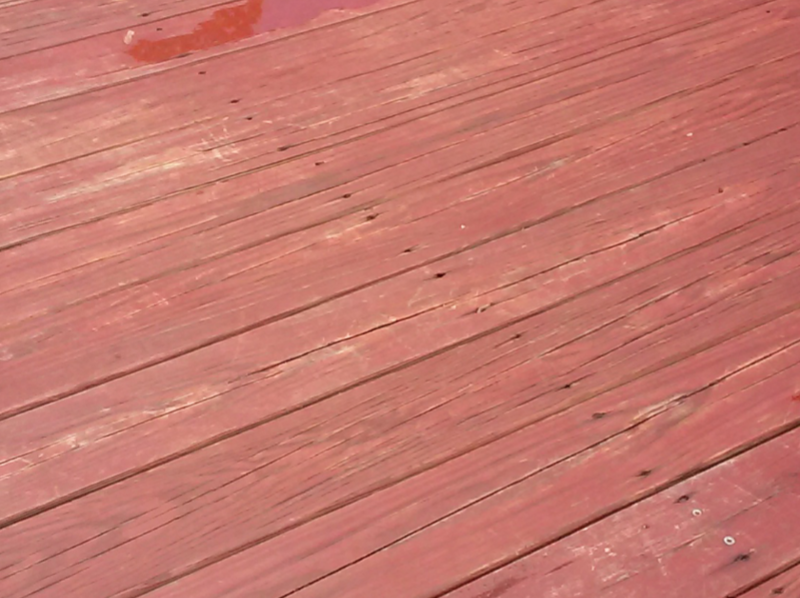 Prevention: Once a month sweep off, blow off, or rinse off your deck. During months where pollen is coating surfaces, or leaves are falling consider a once a week cleaning. Solution: Properly prepare the deck for a new coat of stain. If it is late summer or fall, or if it has only been a few months since the initial stainng consider waiting until the following spring. If you have an over application scenario click here to learn more about treating the over application. If you live in a humid or damp environment consider applying a scrub free mildew stain remover (Wet & Forget) to control surface mildew. 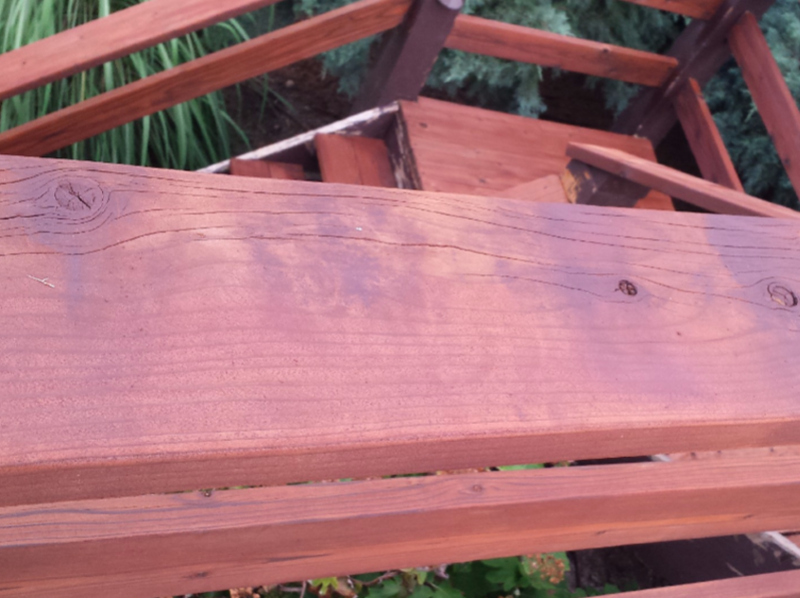 Significant darkening of the stain typically within a few months to a year. Stain disappearing altogether. Explanation: More is not better when applying stain. When too much stain is applied one of the many potential problems is that the wood cannot absorb all the non-drying oil in our stain. When this happens the non-drying oil migrates back to the surface of the wood. When there is a slight over application just a little oil may be sitting near the surface and still have a fairly matte appearence (as opposed to cases where there is a lot of oil that looks glossy). Pollen, dirt, dust, etc… will stick in this oil instead of blowing off. When enough debris builds up over time the stain appears to be darkening when in fact there is a collection of dirt on the surface. This evident in the top portion of the picture. The patches where stain may appear to be gone altogher are from where the non-drying oil at the surface prevented the drying oil from drying. The drying oil carries the pigment and if it cannot dry, and gets washed away in rain or via traffic it will take the pigment with it leaving a bare patch. 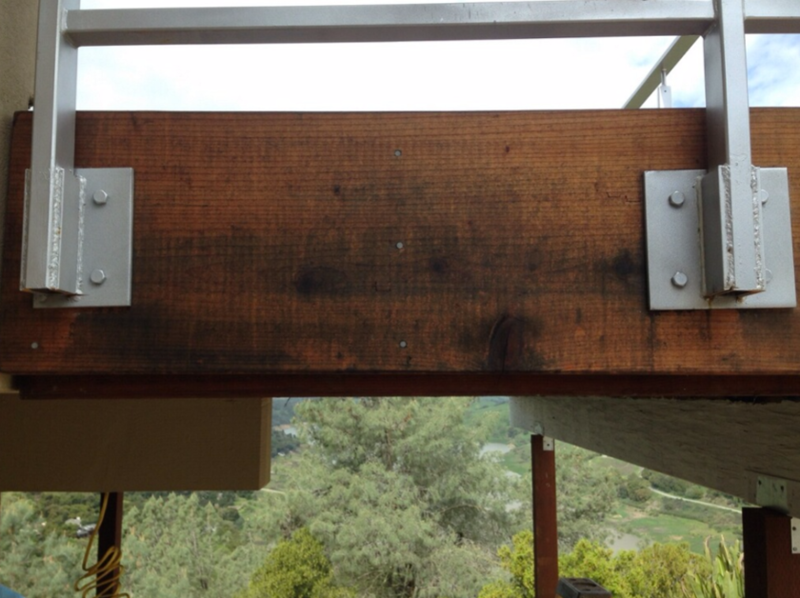 Additionally, on large decks that are closer to the ground there may be inadequate air ventilation underneath. 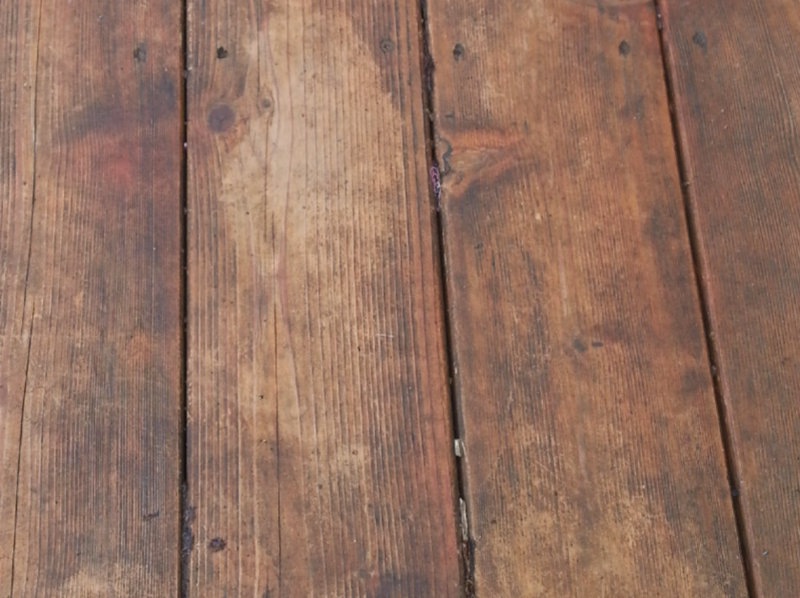 When this is the case the moisture coming up through the ground is forced to pass through the wood creating conditions that deteriate the bond between the wood and wood stain. Prevention: For Over Application: When testing for color apply the stain just like you will when completing the job. Observe how long it takes for the stain to absorb into the wood. If it takes longer than 60 minutes extra care should be taken to put apply a lighter coat. DO NOT apply semi-solids to wood less than a year from installation and DO NOT apply two coats of semi-solid stains to surfaces other than fire-retardent shingles. Prevention for Excessive Moisture: Always test moisture content before applying stain to make sure it is 20% or less. For decks that are already built remove any and all skirting to promote cross ventilation. This may help. Otherwise there may not be much you can do. 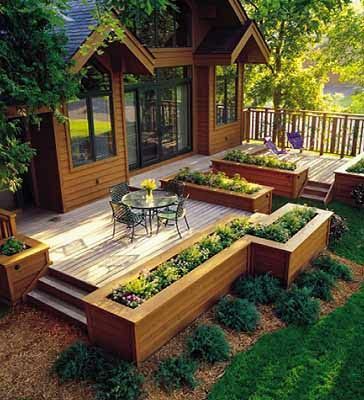 For decks not yet built seriously consider not building a deck on the ground or a deck with skirting. Where skirting is desired, consider lattice to stll allow air circulation. Additionally, do not prep wood with higher than 80 grit sandpaper. 60 grit may better serve you especially in decks close to the ground to open up the pores more. Lastly, be sure to not over apply the stain during application. Solution For Application: Use a solution of warm water and a squirt of liquid dish detergent for each gallon of water used. Gently scrub the surface of the wood with a soft bristle brush and rinse thoroughly. The liquid dish detergent will help break up excess oil (similar to grease and fat on our plates) and the soft bristles and gentle scrubbing will prevent furring of the wood, or scratching of the surface stain (as opposed to a stiff bristle or hard scrubbing) while helping remove dirt. If a rainbow (oil) appears on the surface of puddles ten minutes after the rinsing process then there is still an excess amount of oil near the surface. Flood the surface of the wood with water from a hose once a day for several days. Wait about 10 minutes after flooding and then gently rinse the water away. The logic here is that oil floats on water. The oil will float to the surface of the water and the rinse away in the rinsing process. If after three days you still experience some issues reclean the surface of the wood with additional light scrubbing using a liquid dish detergent solution. Solution for moisture: Unfortunately if the wood is close to the ground or there is not good air circulaton there really isn’t any solution other than what is mentioned in “Prevention”. Moisture is wood and wood stains worst enemy regardless of product or brand. Explanation: Certain woods have higher concentrations of an extractive called tannin (tanic acid), especially redwood, some cedar’s, and ipe. Additionally, there are higher concentrations of tannin in heartwood than sap wood. There are two types of tannin bleed. One appears as pronounced black streaks or dots (almost like mold) called run down tannin bleed, and the other looks blotchy and is called diffuse bleeding. Moisture (water) will induce the tannin to start coming to the surface of the wood. These images depict diffuse tannin bleeding. Prevention: Always clean wood, even if new. After cleaning wood moisture content should be 15% or less when staining cedar shingles or redwood (especially heartwood), and 20% or less for other woods. Although oil isn’t technically moisture, it has been found to help induce tannin bleed when moisture contents are higher than 15%. Where moisture will be present it is good to stain all sides of these woods. 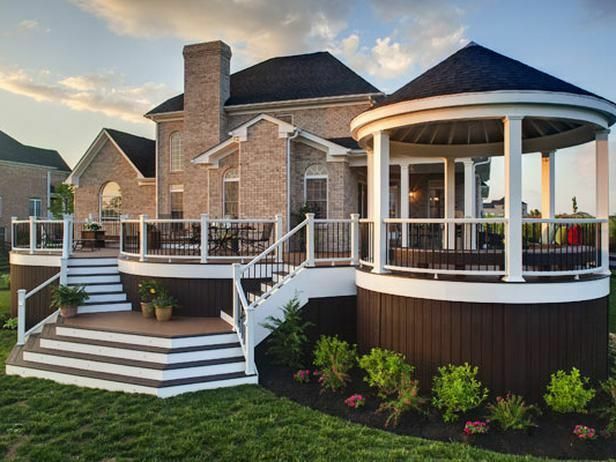 Typically these would be decks built close to the ground or on walls or siding. Staining all sides helps prevent moisture from penetrating into the wood. Solution: The wood must be treated with oxalic acid. Oxalic acid is the only thing that removes tannin stains. For new wood it is recommended to wait a year before properly cleaning the wood. Be sure to clean with a cleaner/ brightener that has oxalic acid. If the project needs to be immediately redone use a stripper, then a brightener before re-staining. Explanation: Certain woods have higher concentrations of an extractive called tannin (tanic acid), especially redwood, some cedar’s, and ipe. Additionally, there are higher concentrations of tannin in heartwood than sap wood. There are two types of tannin bleed. One appears as pronounced black streaks or dots (almost like mold), the other looks blotchy and is called diffuse bleeding. Moisture (water) will induce the tannin to start coming to the surface of the wood. Prevention: Always clean wood, even if new. After cleaning wood moisture content should be 15% or less when staining cedar shingles or redwood (especially heartwood), and 20% or less for other woods. Although oil isn’t technically moisture, it has been found to help induce tannin bleed when moisture contents are higher than 15%. Where moisture will be present it is good to stain all sides of these woods. 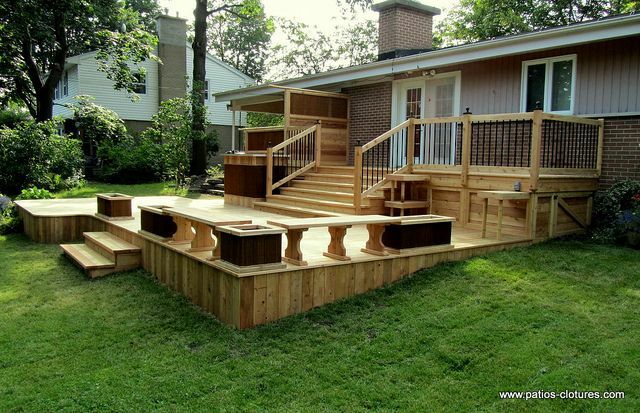 Typically these would be decks built close to the ground or on walls or siding. Staining all sides helps prevent moisture from penetrating into the wood. 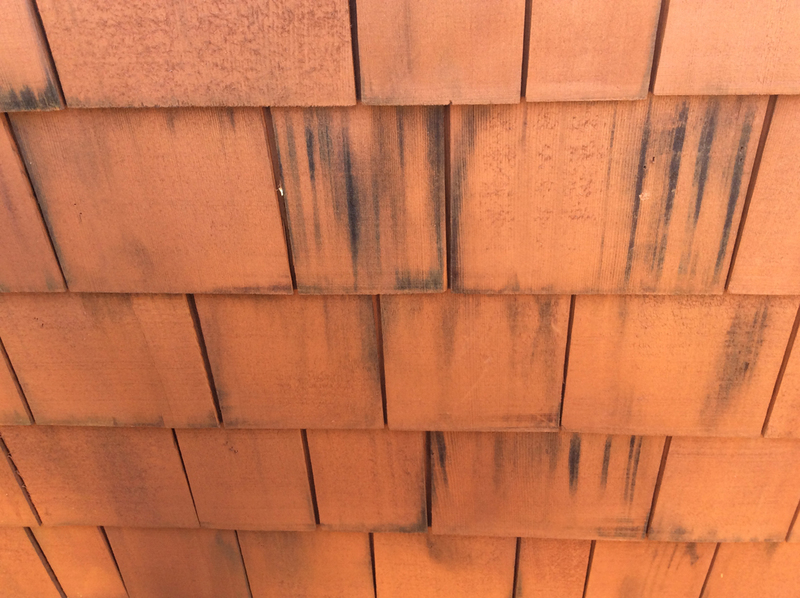 On fire retardant shingles apply two coats of semi-solid stain wet-on- dry with at least 48 hours between coats. Solution: The wood must be treated with oxalic acid. Oxalic acid is the only thing that removes tannin stains. For new wood it is recommended to wait a year before properly preparing wood to be restained. If the wood does not have stain on it clean the wood with a cleaner/ brightener that has oxalic acid. If the project needs to be immediately redone use a stripper, then a brightener before re-staining. Explanation: Certain woods have higher concentrations of an extractive called tannin (tanic acid), especially redwood, some cedar’s, and ipe. Additionally, there are higher concentrations of tannin in heartwood than sap wood. There are two types of tannin bleed. One appears as pronounced black streaks or dots (almost like mold), the other looks blotchy and is called diffuse bleeding. Moisture (water) will induce the tannin to start coming to the surface of the wood. These images depict diffuse tannin bleeding. Testing: To confirm whether it is tannin or mold/ mildew get a rag and wipe the surface of the wood. If the spots come off with the rag is it mold or mildew. If it does not come off get some sandpaper and very lightly sand to the black spots. Dap a rag in some bleach and rub the black spots. 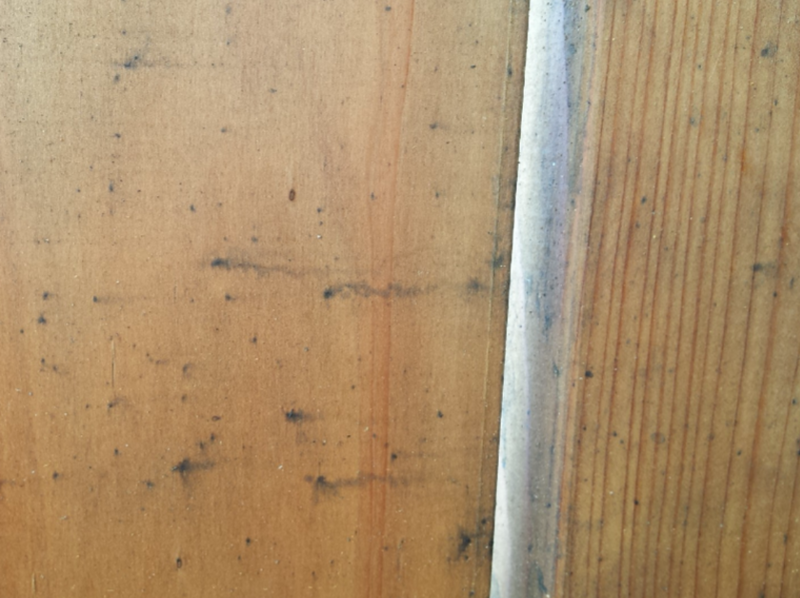 If the black spots disappear it is mold under the stain resulting from poor wood preparation. If the black spots do not disappear it is tannin. 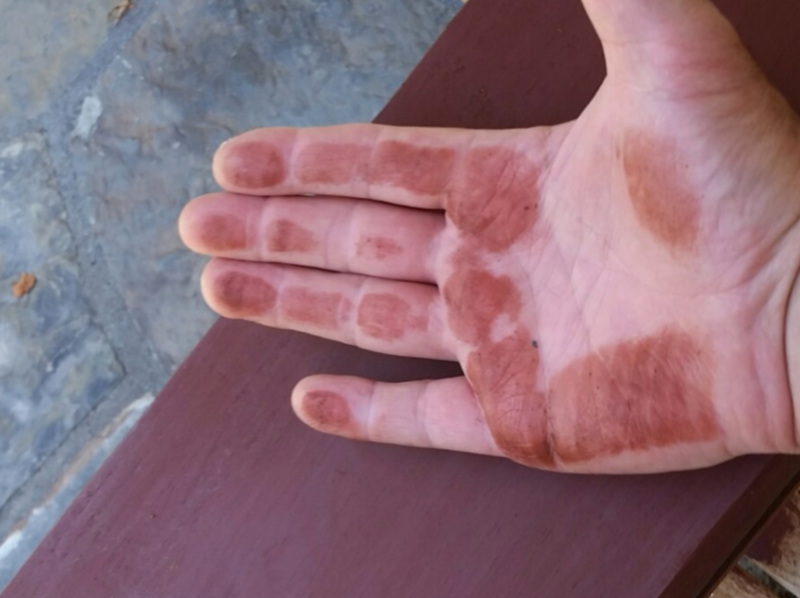 If you have redwood, especially heartwood, chances are it is tannin. Prevention: Always clean wood, even if new. If cleaning redwood use an oxalic acid based cleaner brightener. 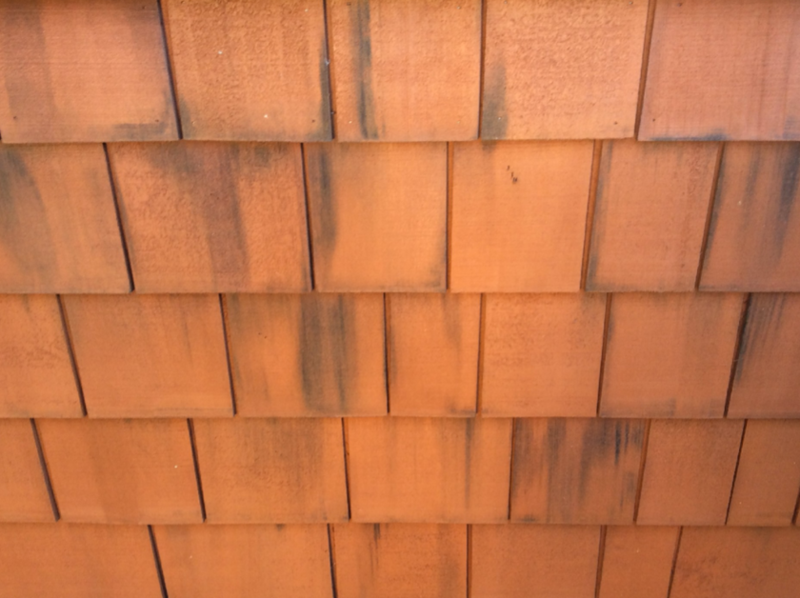 After cleaning wood moisture content should be 15% or less when staining cedar shingles or redwood (especially heartwood), and 20% or less for other woods. Although oil isn’t technically moisture, it has been found to help induce tannin bleed when moisture contents are higher than 15%. Where moisture will be present it is good to stain all sides of these woods. 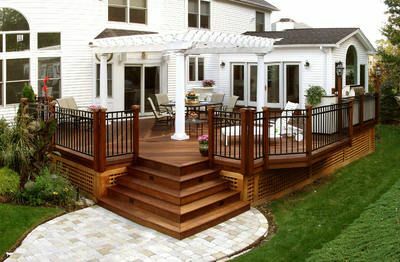 Typically these would be decks built close to the ground or on walls or siding. Staining all sides helps prevent moisture from penetrating into the wood. Furry surface before staining, lighter colored or yellowish fuzz after staining. Cause(s): Excessive scrubbing, excessive pressure when power washing, too strong cleaning chemical, cleaning chemicals left on the wood too long before rinsing. Explanation: Excessive pressure in the cleaning process will mechanically destroy the surface of the wood. Chemicals that are too strong or left on the wood too long with chemically destroy the surface of wood. When furr or fuzz is not removed prior to staining the pigments will get caught up in the fuzz. In some cases the pigment can appear yellowish in color. This is common with exotic woods like ipe. Prevention: Follow the instructions for cleaning chemicals for proper use. Do not scrub excessively hard. When pressure washing use the lowest pressure setting. You want the chemicals to do the cleaning, not pressure. Think of a power washer as a higher pressured rinse and not a means to actually clean. Solution: Wood must be sanded. Do not use higher than 80 grit sandpaper. 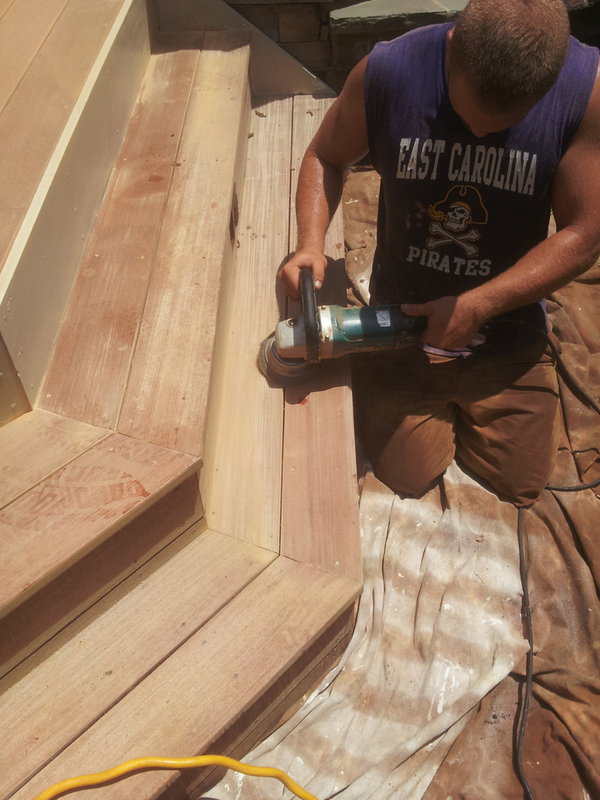 If you are a professional, use defelting pads on exotic hardwoods like ipe. If you are a homeowner and have ipe fuzz/ furring, lightly sand with 80 grit sandpaper to remove the fuzz, but try not to sand down into the wood. Explanation: This is “raised grain”. Excessive pressure when scrubbing or power washing in the cleaning process will mechanically destroy the surface of the wood by removing the softer part of the wood andleaving the harder part of the wood grain. Prevention: Do not scrub excessively hard. When pressure washing use the lowest pressure setting. You want the chemicals to do the cleaning, not pressure. Think of a power washer as a higher pressured rinse and not a means to actually clean. Solution: Wood must be sanded. Do not use higher than 80 grit sandpaper. Use a lower grit of sandpaper like 35 grit to start if the raised grain is significant before finishing with 60 grit. 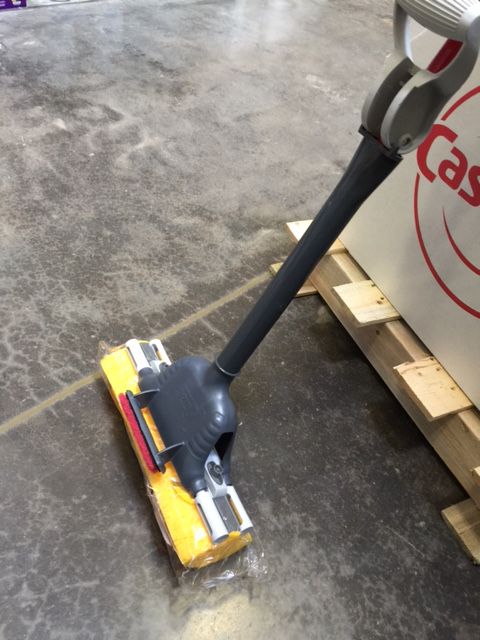 Cause: Use of a roller that has been contaminated (possibly with water) or poor preparation. Explanation: When a roller has been used and a pattern appears chances are either the roller got contaminated, or there was an uneven coating of the roller before applying the stain. This result is seenon the right side of the image. When the roller does not have enough stain in it, or it has been mixed with some water you will get a splotchy appearance as soon on the left side of the photo. 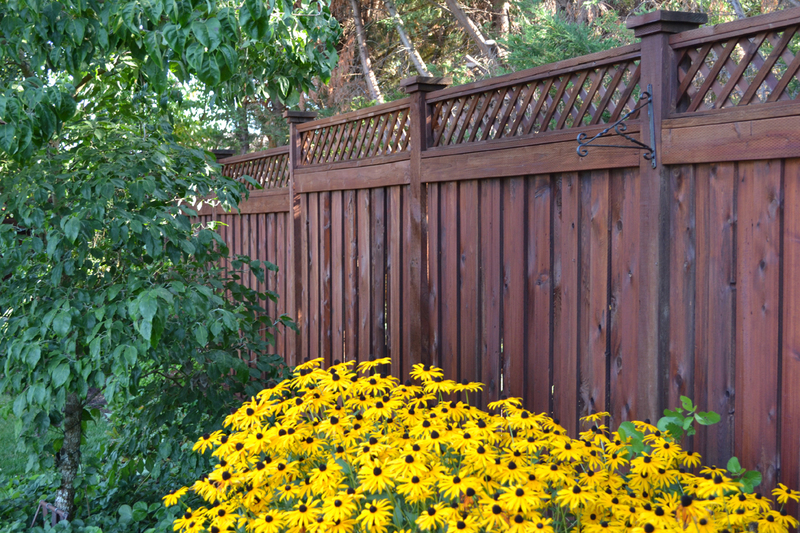 Prevention: Be sure to that wood is completely dry before staining, including making sure morning dew has burned off. 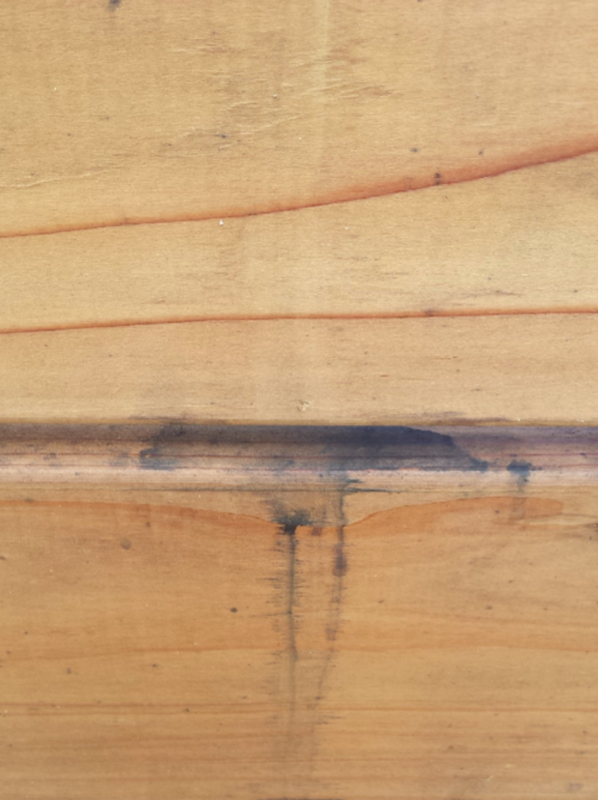 Morning dew or water from sprinkler systems will often wet wood and over overlooked in the pre-stain check process. Solution: Often stripping, brightening, and restaining are required. If the wood is a softwood that is more than a year old, only one coat of stain has been applied, and a semi-solid is not being used, apply a second light coat of stain. Be sure to test first to insure adequate absorption before completing the project. Q. Why does wood deteriorate? A. Pure and simple it loses its protective nondrying natural oils. The wood turns gray, splits and absorbs water - the food source for infestation. Q. How is Armstong's different? A. Armstrong has nondrying oils in the formulas. During the drying process these oils completely separate; penetrate deep and bulk into the dry wood fibers. The balance of the formula dries on top and locks in the nondrying oils. You get two layers of protection with one spray pass or brush stroke. Q. Do you use Titanium-dioxide in your formulas? A. Titanium-dioxide is used by most paint and stain manufacturers to increase hide (opacity). We feel that this clouds the final color. We only use Transparent-oxide and earth colors in our coatings. The color is therfore much sharper. Q. Does Shake Shield allow the shakes to breathe? A. Yes, Shake Shield repells liquid (H20) however vapor from inside the house is free to exit. Q. Why use Armstrong's Wood Stain?